Happy Easter, my friends! I hope you’re being able to enjoy this long weekend surrounded by your loved ones! I’ll be cooking, baking and enjoying quiet time with my family. But before I do that, I wanted to leave you guys with a very special “Beautiful Homes of Instagram” feature. 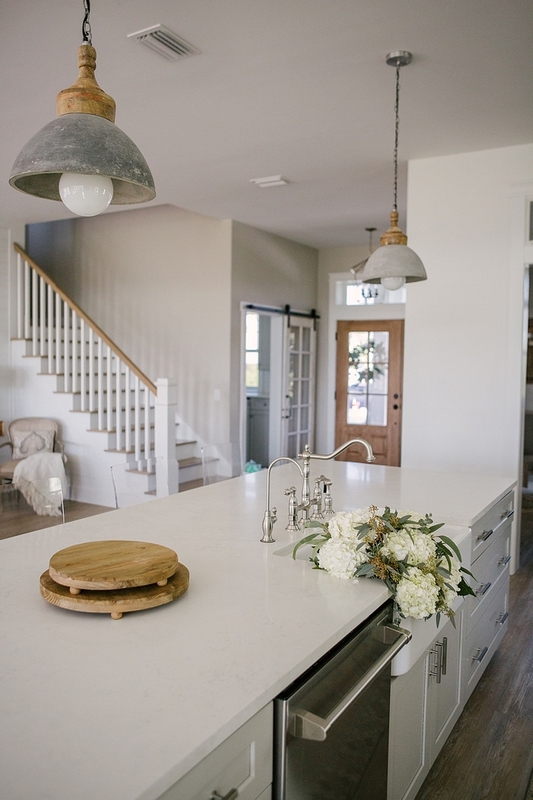 Jessica of @carcabaroad, along with her husband Jody, designed and build this coastal farmhouse to raise their growing family. 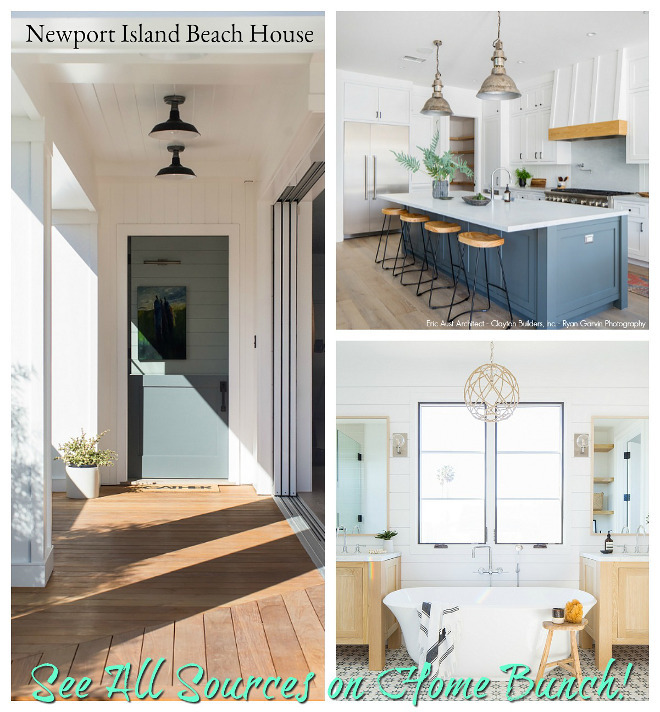 They tried to keep costs down while building this beach house and Jessica is sharing a few details about that here on Home Bunch. 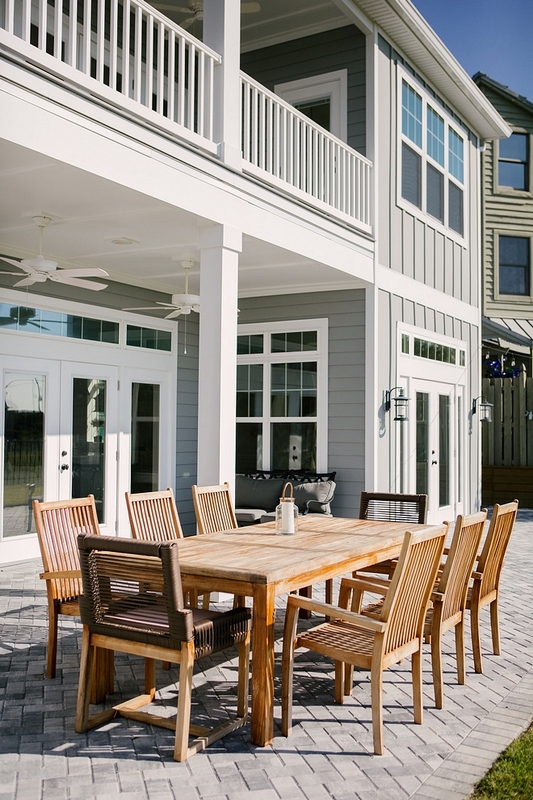 Besides being busy raising their four children, they also have FOUR rental properties in Florida and, listen closely, they have renovated or built and designed all of them. How do they do all that? I am sure Jessica hides a “Superwoman” cape somewhere in her closet! 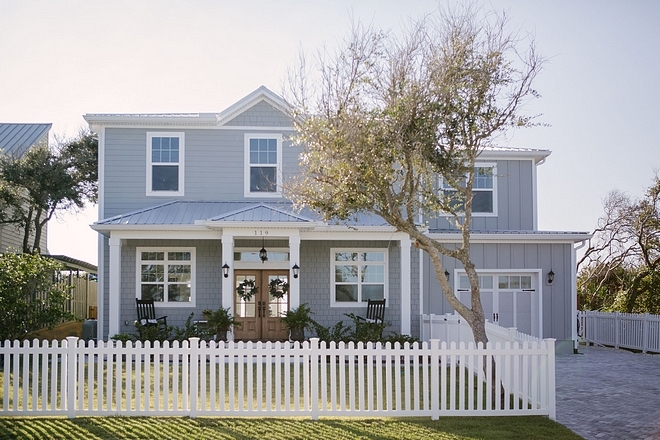 Welcome to our Florida farmhouse! 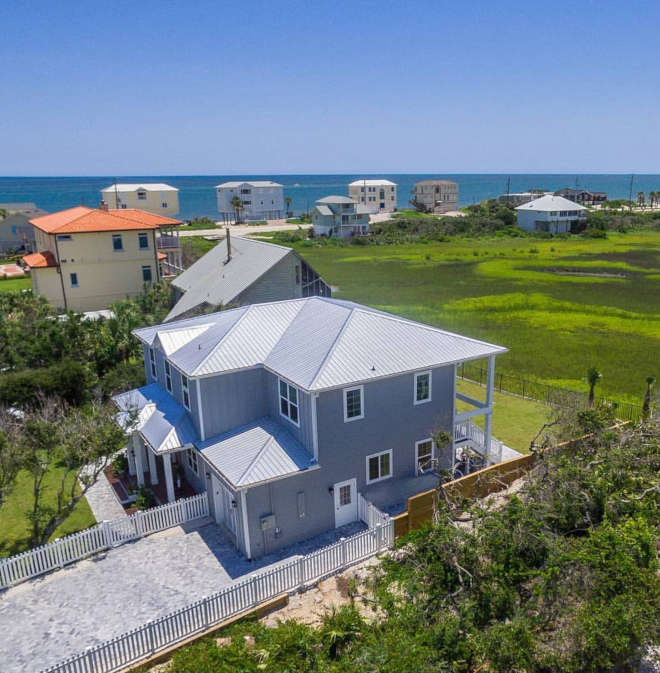 My husband and I designed and built the 2,900 sq ft 6 bedroom 3 bath home after finding this beautiful 75 by 130 sqft lot in Paradise just a block from the beach and short walk to the intercoastal. 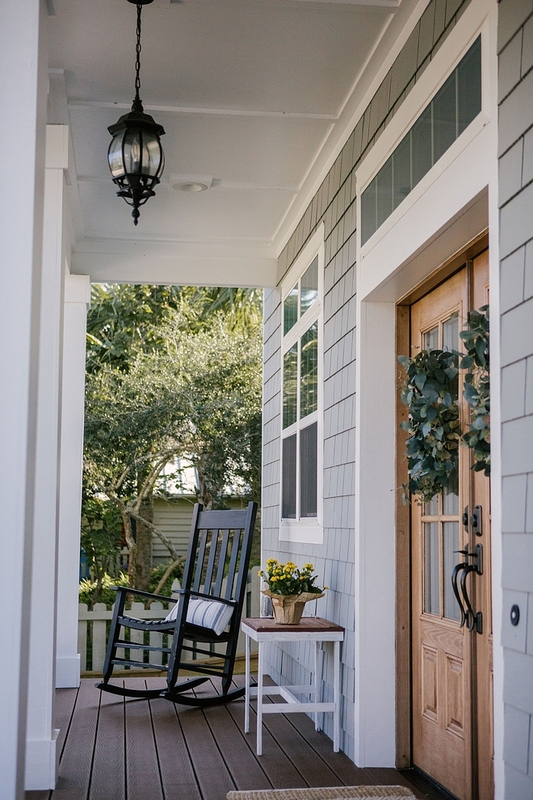 We kept a basic exterior to stay in the budget and added versatile siding, a double door entry, front porch and back upper deck to dress up the exterior. 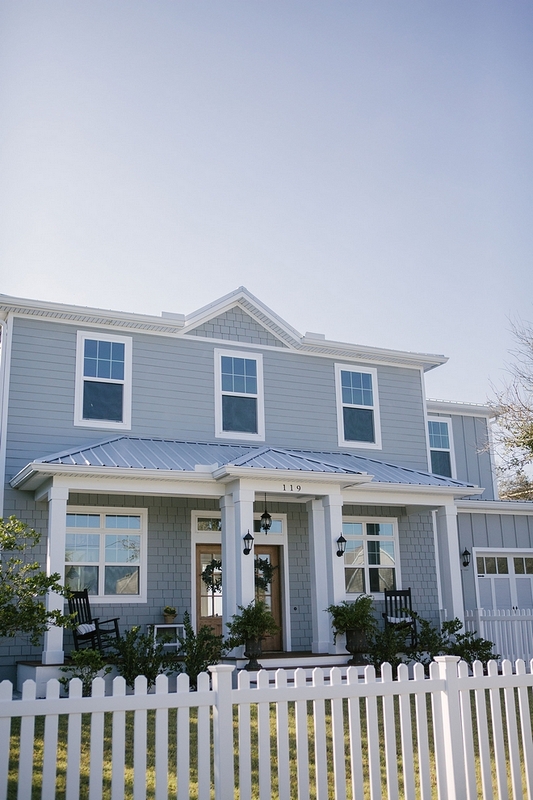 The grey exterior paint color is Behr Sharkskin PPU25-04. 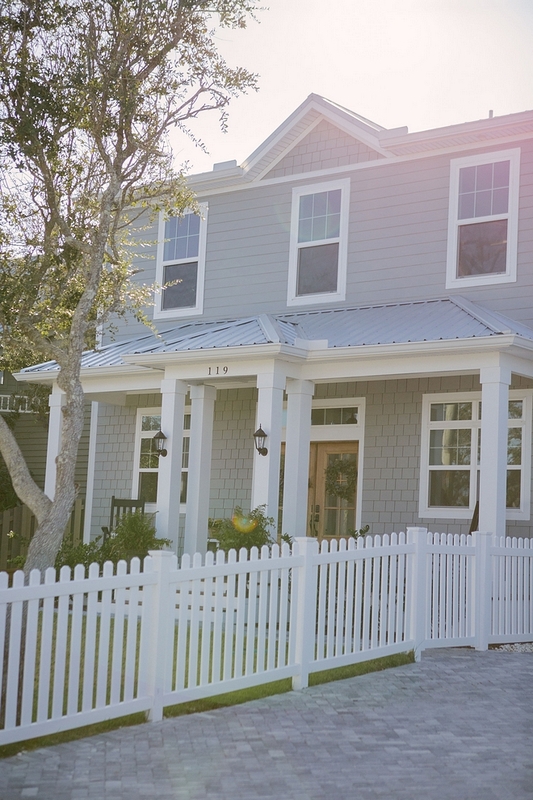 Creating this home in our minds and seeing it come to life from the ground-up was truly our greatest achievement and a dream come true. 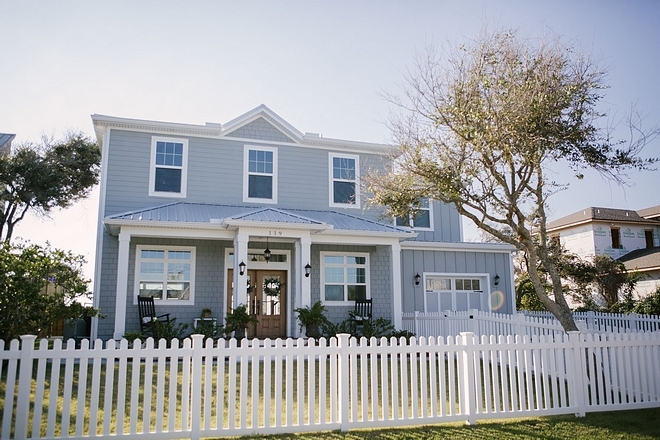 What a curb-appeal! Windows are MI Windows 1620 Series. 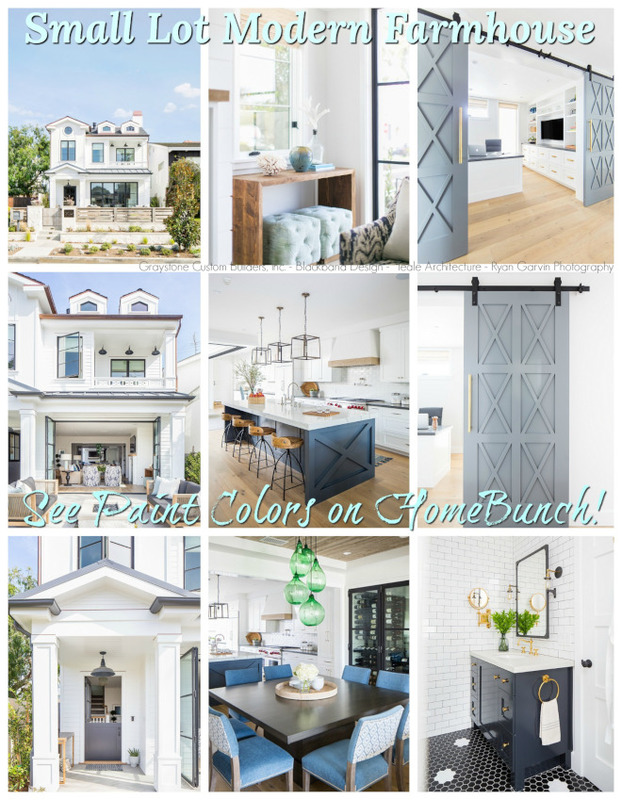 Outdoor Sconces: here – similar. 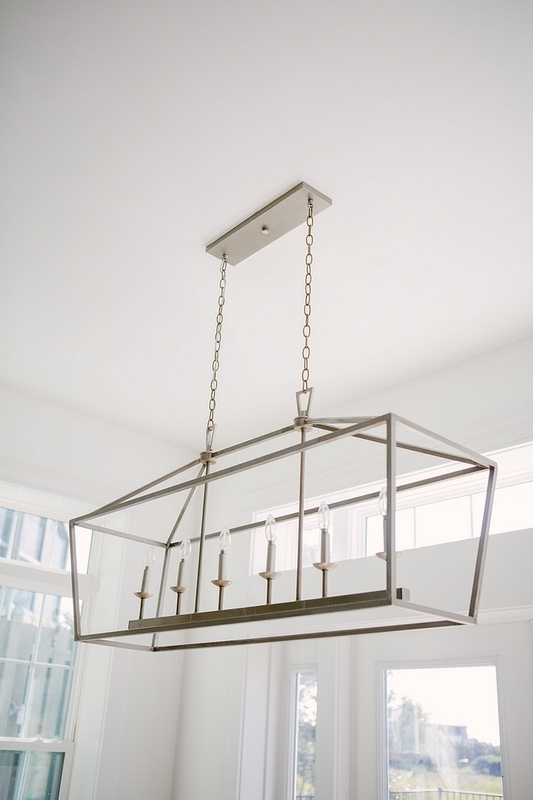 Outdoor Pendant: here – similar. 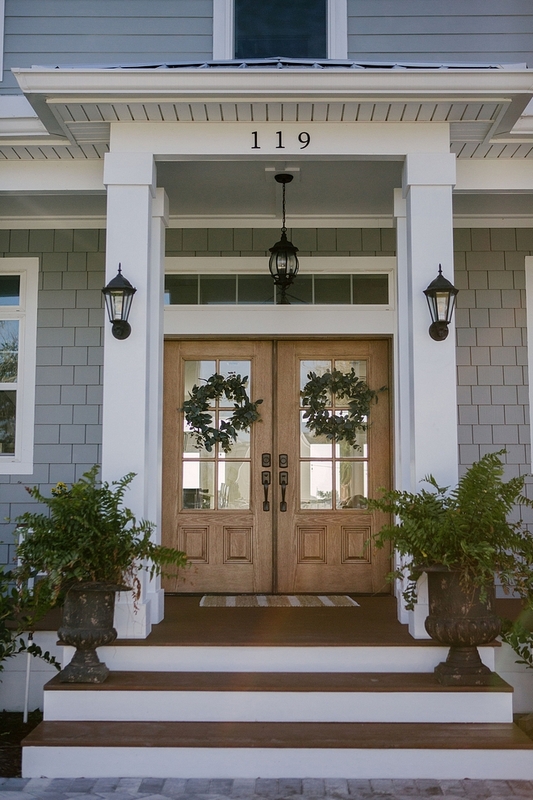 You might remember seeing Jessica’s porch decorated for Christmas on Home Bunch last year. 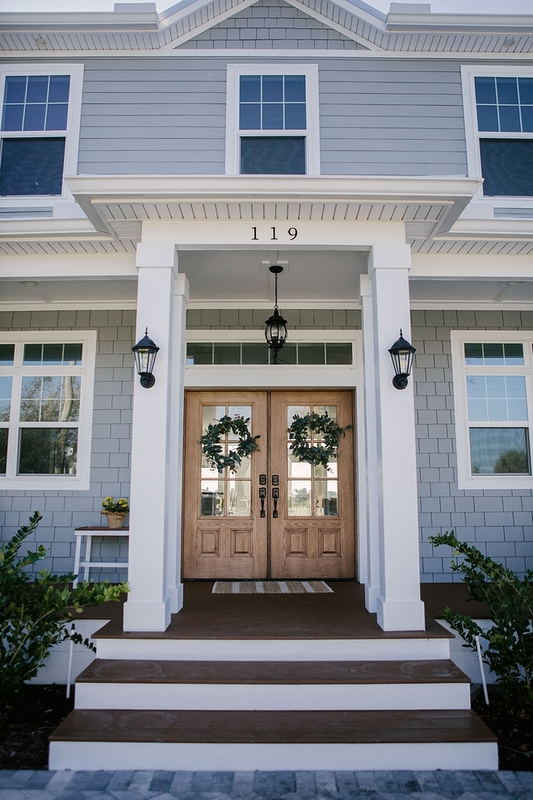 Her porch is one of my favorites on Instagram! Beautiful Outdoor Pillows: here, here, here, here, here, here & here. 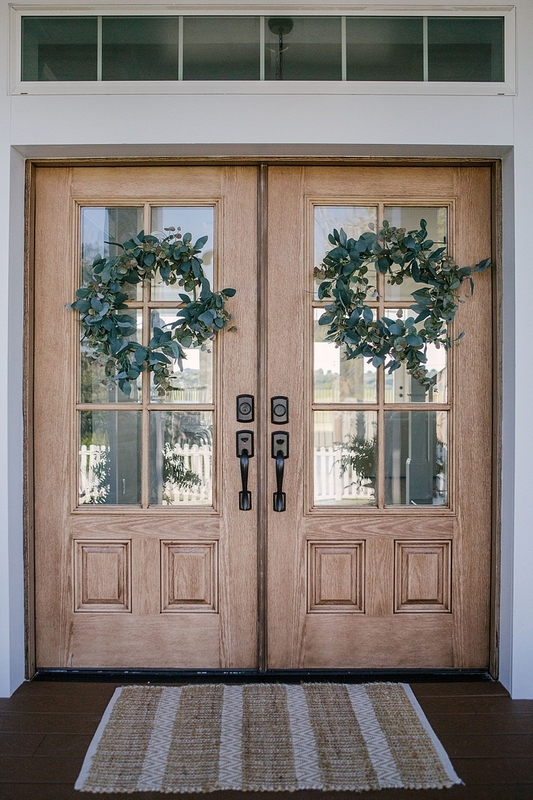 Front Doors are Jeld-Wen Pro Series Doors. 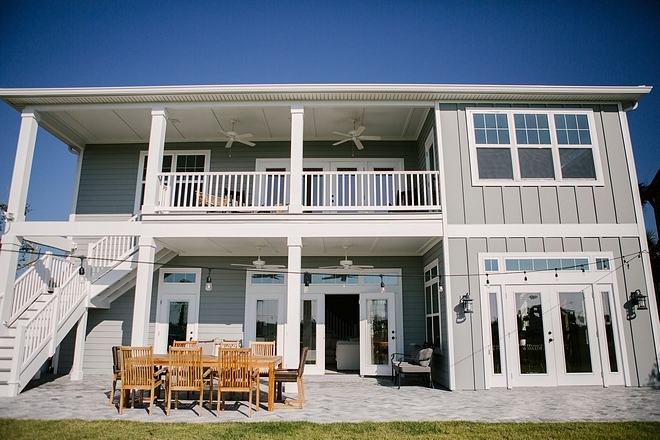 Our main goal as a family of 6 with 4 growing children was to build a house with an open floor plan that we could grow along with. 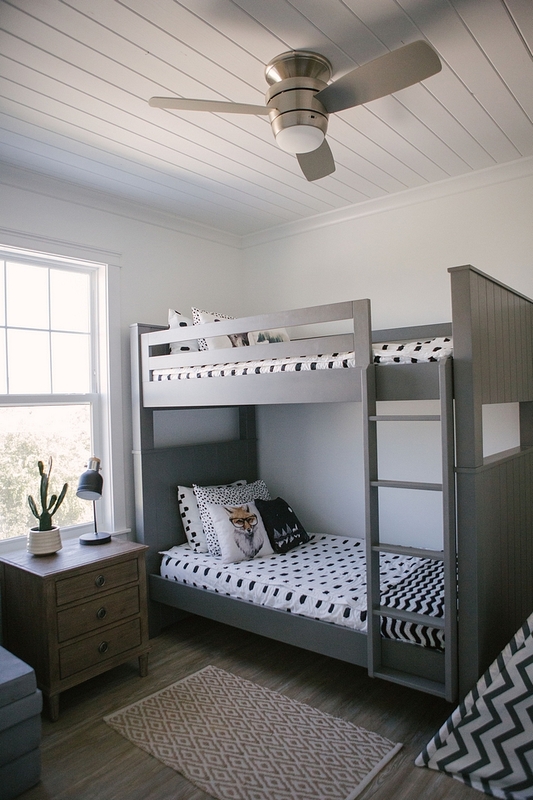 I am one of six kids and we did a lot of room changes through our adolescence some of us as siblings would share rooms and then at other ages we would want our own space. I was sure to keep the future in mind while designing this floor plan. We shrunk the sq footage of the bedrooms to maximize living space and added a second upstairs living area. 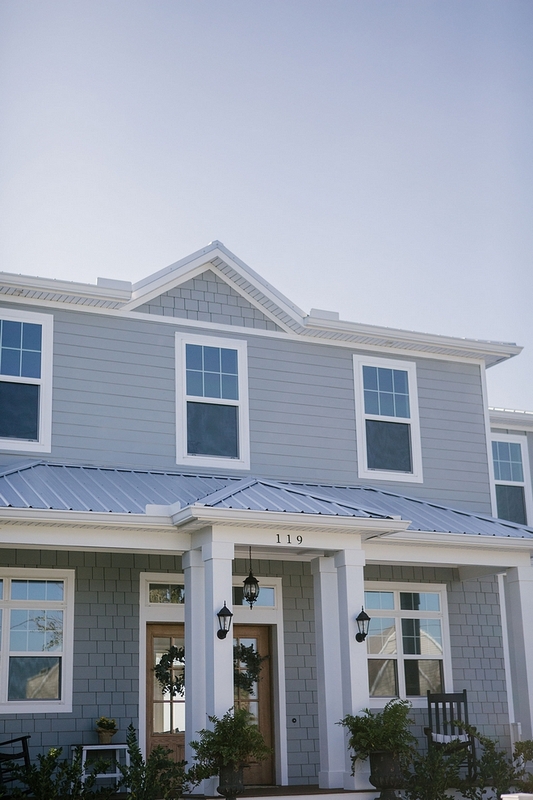 We we’re blessed with a beautiful view and windows and transoms were definitely on our top must haves. 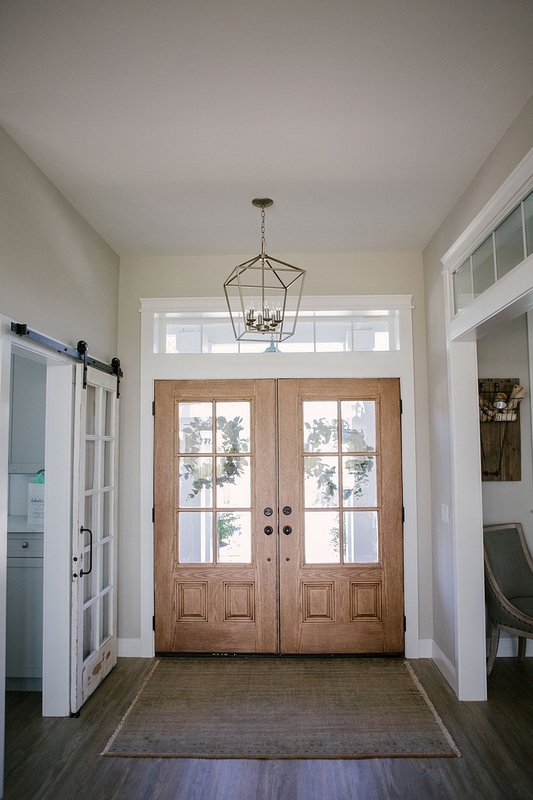 The front doors open to a beautiful foyer with plenty of natural light. 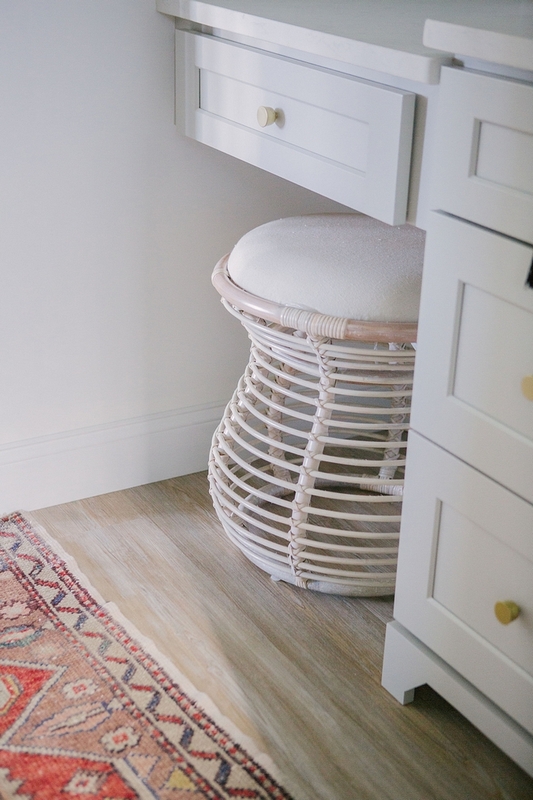 Rug: Vintage – Other Entry Rugs: here, here, here, here, here, here & here. Definitely there’s no need for a fireplace in Florida but I’ve always dreamed of one and my husband surprised me one day and came home with it. That began the search for the perfect mantle and believe it or not the old piece of drift wood we used was sitting in our garage brought back from the Bahamas by his uncle. It was part of an old ship and all of the holes are from sea worms. 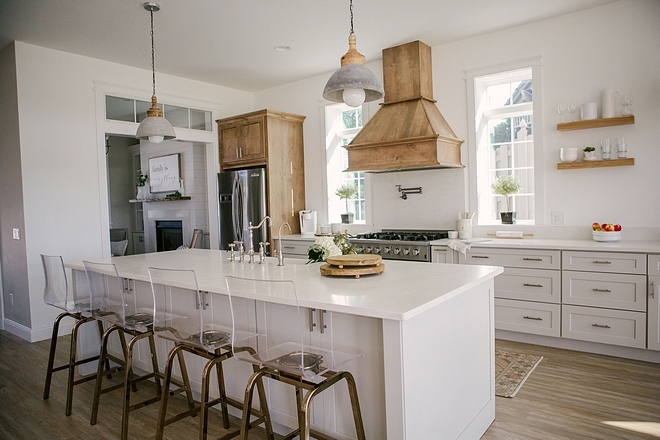 Adds the perfect amount of character to this modern space. 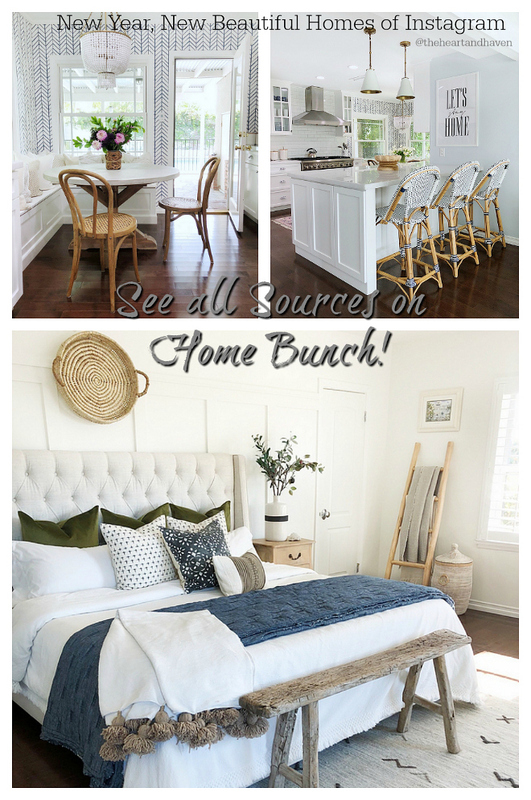 Rug: HomeGoods – Others: here, here, here, here & here. 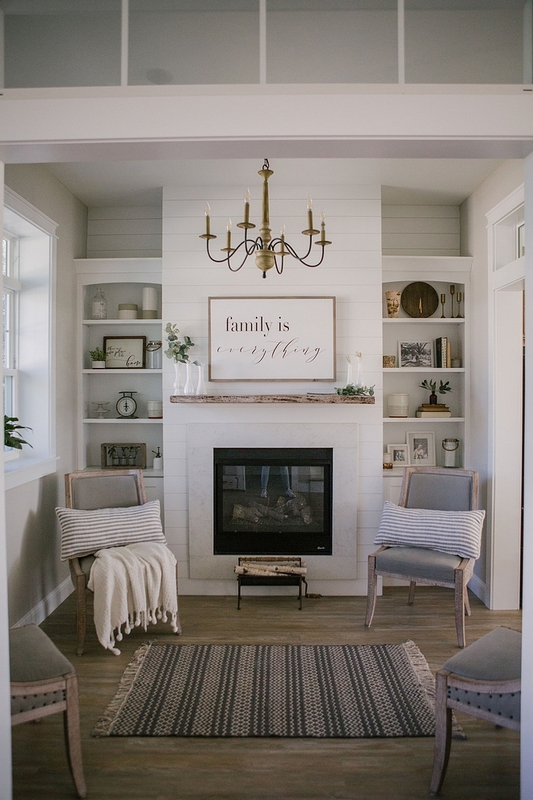 Trim, built-ins and fireplace are painted in Sherwin Williams Pure White. 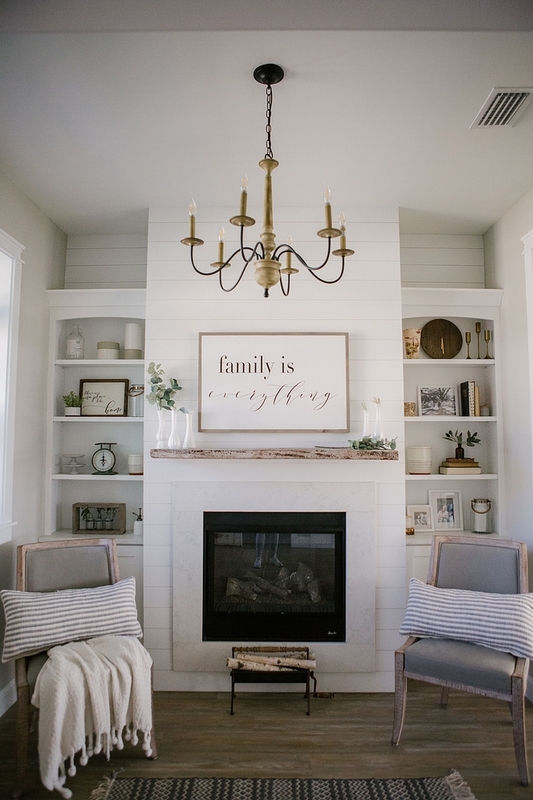 ‘Family is Everything’ Sign: Etsy. Beautiful Striped Pillows: here & here. 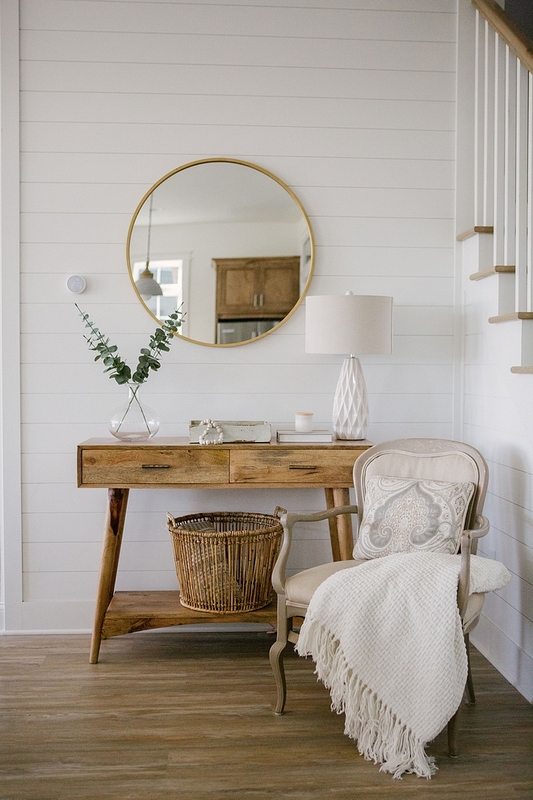 The foyer also features shiplap walls and a Mid-century inspired console table. 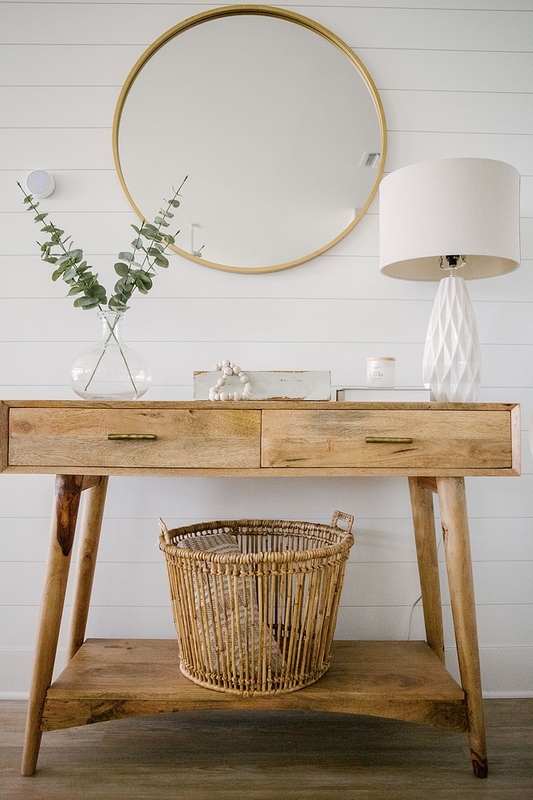 Mid-century Console Table: HomeGoods – Others: here, here, here & here. 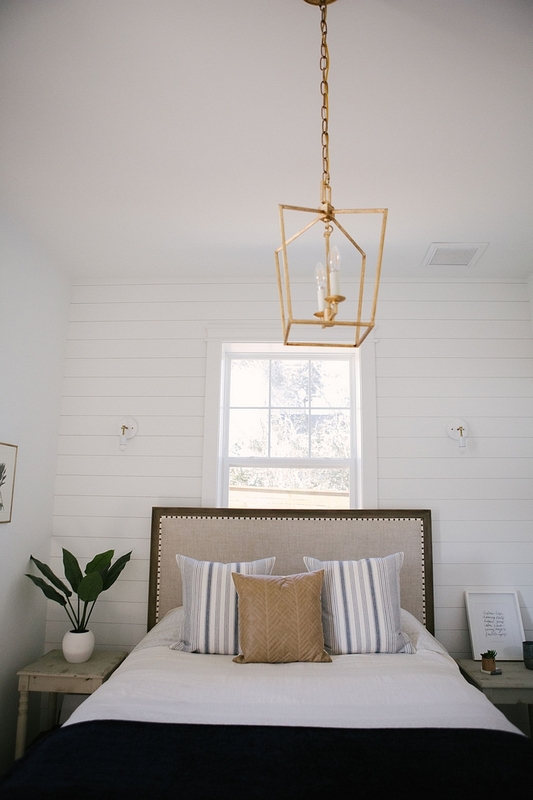 Affordable Table Lamps: here, here, here, here, here & here. 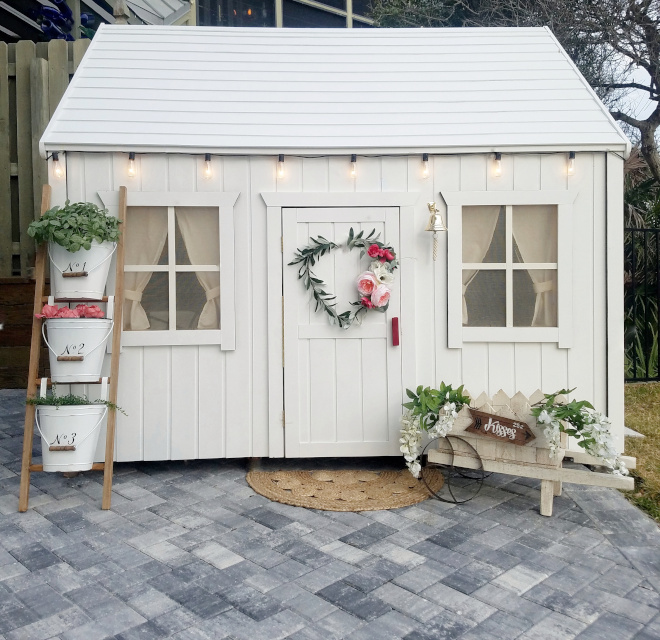 Faux Greenery: here, here & here. 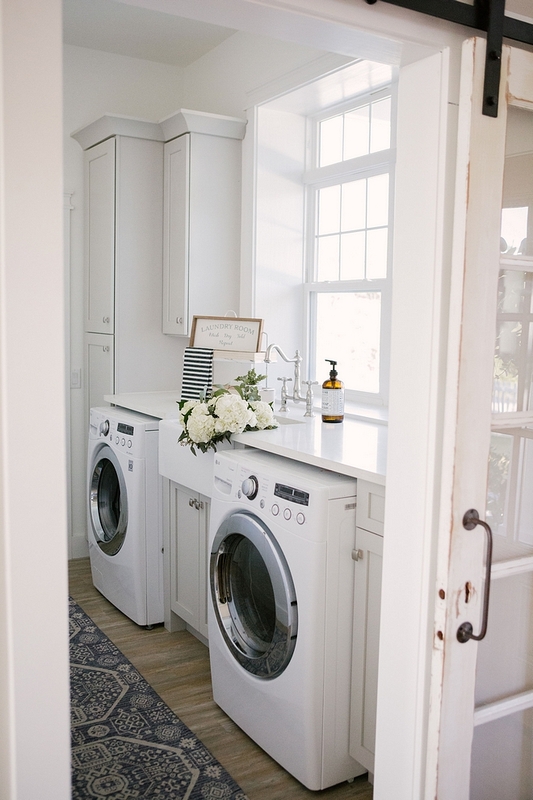 As a mom of four with a husband that surfs and fishes I spend most of my time in the laundry room and in the kitchen and they are the two spaces that my husband loosened the budget belt. 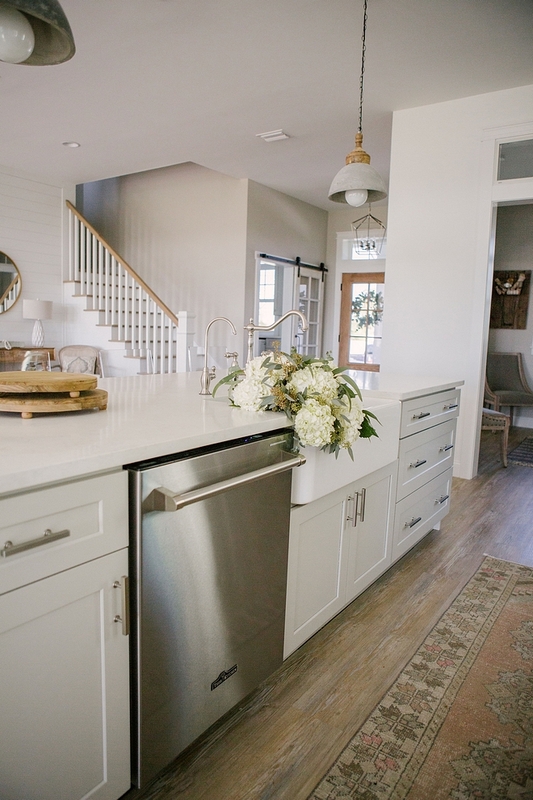 I am so happy that we made the decision to stray from an all white kitchen as beautiful classic and timeless as they are, our kitchen is the heart of the home and one of a kind. 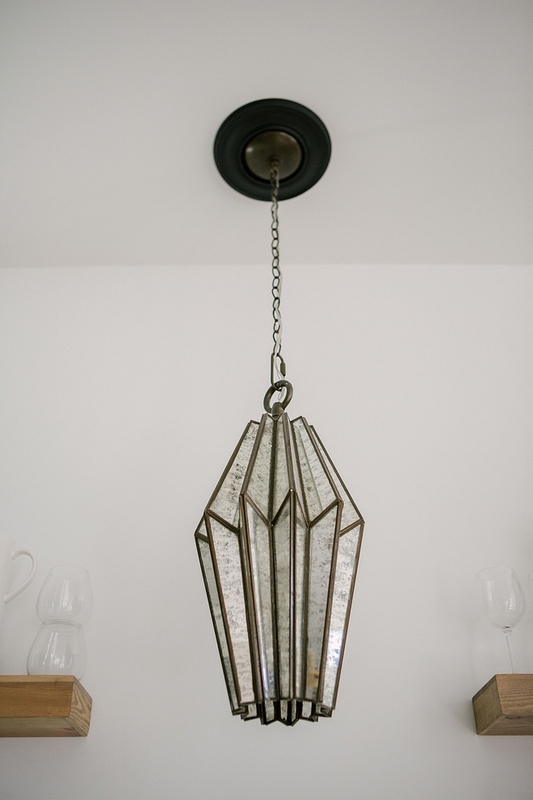 Concrete Pendants: Discontinued – similar here, here & here. 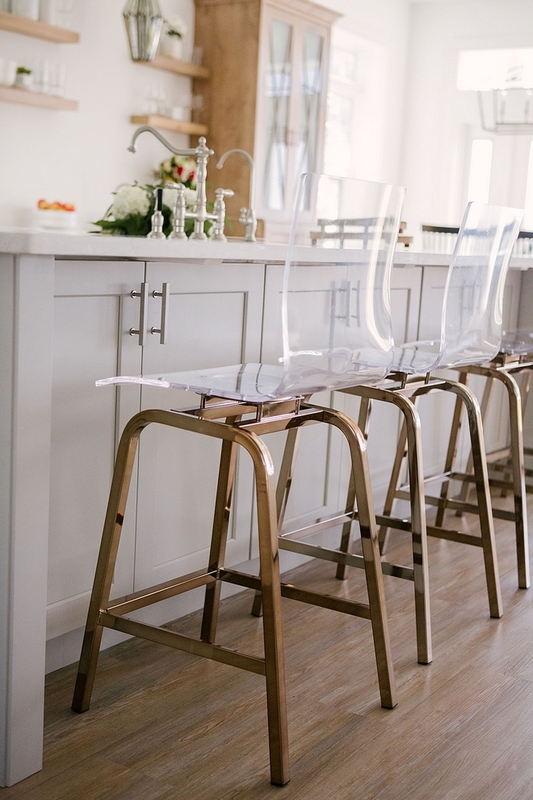 These Clear Acrylic Swivel High Back Counter Stools give an airy feel to Jessica’s kitchen. 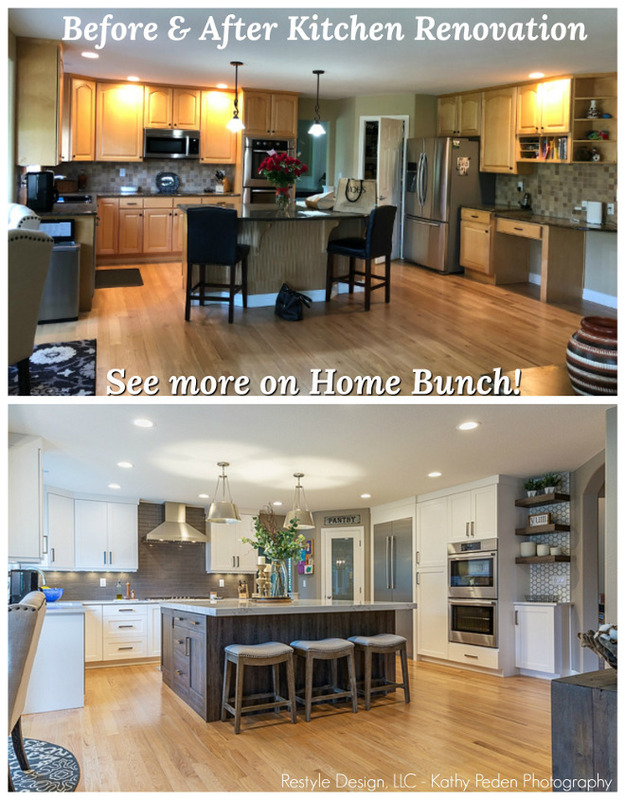 Kitchen Cabinetry: UScabinet Depot Dove Shaker, Lowes Home Improvement. 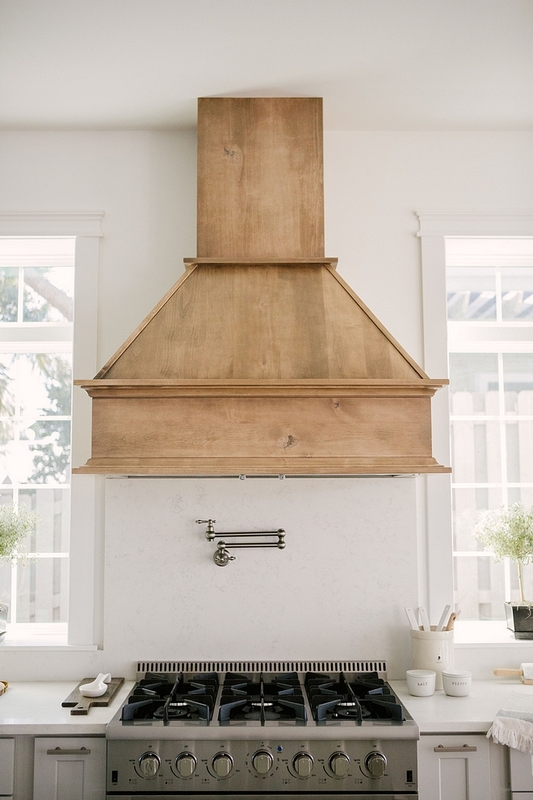 Appliances: Thor Appliances 36 inch range and hood vent. 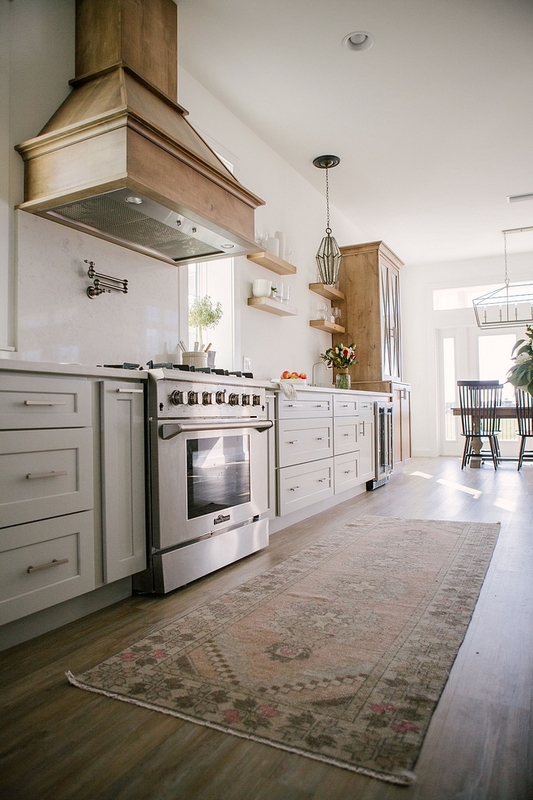 Kitchen runner: Violet Vintage Rugs – Others: here, here, here & here. 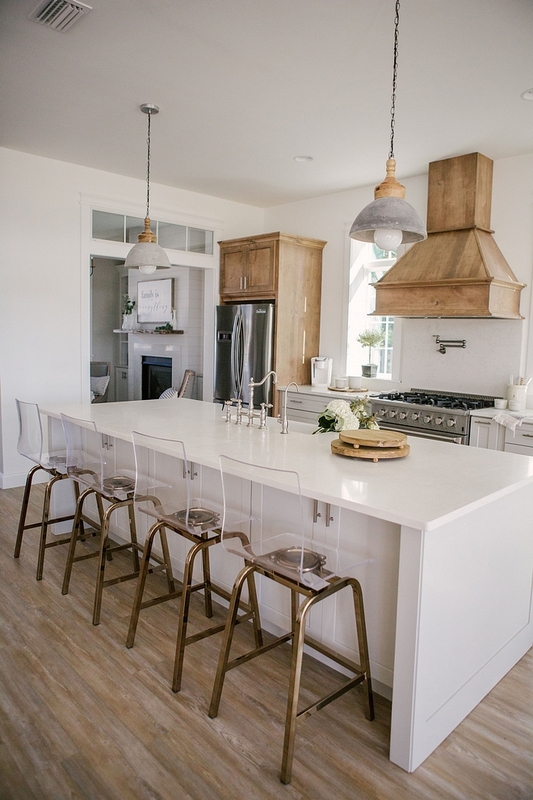 Backsplash: Quartz Snow Point Slab. 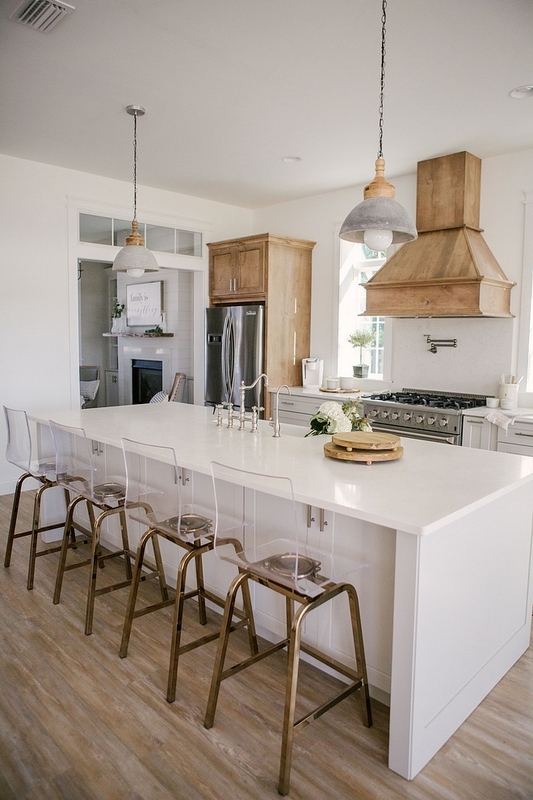 The island features the same quartz countertop, Snow Point. 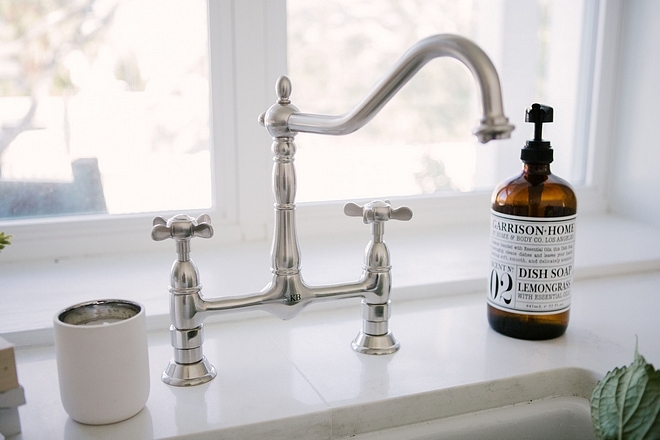 Kitchen Faucet is Kingston Brass. 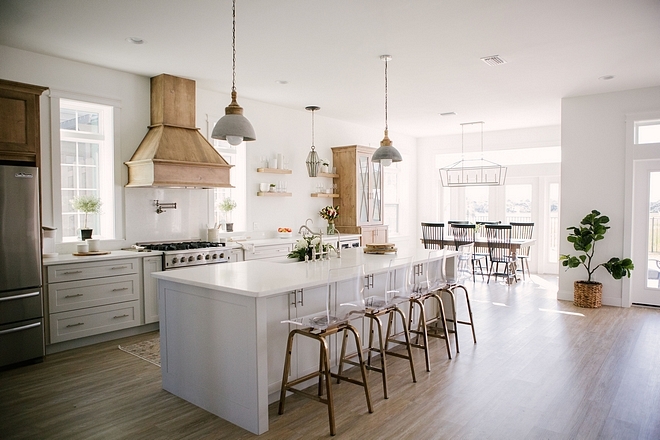 The kitchen is very spacious and it has an open and airy feel. 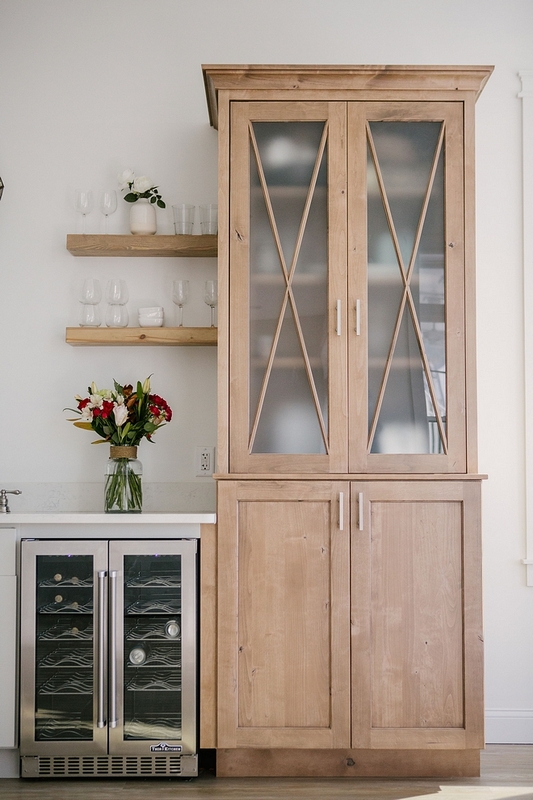 This kitchen also features a custom bar with open shelves and hutch. Pendants: No longer available – Other Mercury Glass Pendants: here, here, here, here, here, here, here & here. 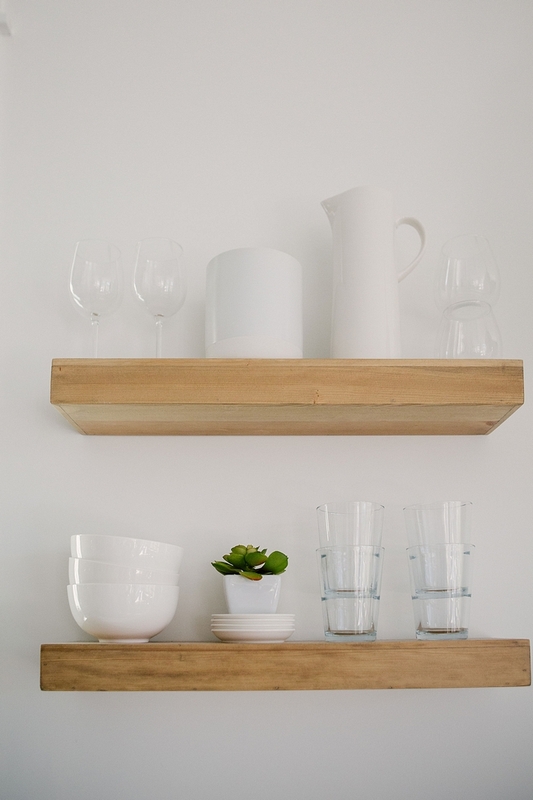 Kitchen Open Shelves: Target Real Wood Floating Shelf – 24″ – Threshold – Others: here, here, here, here & here. 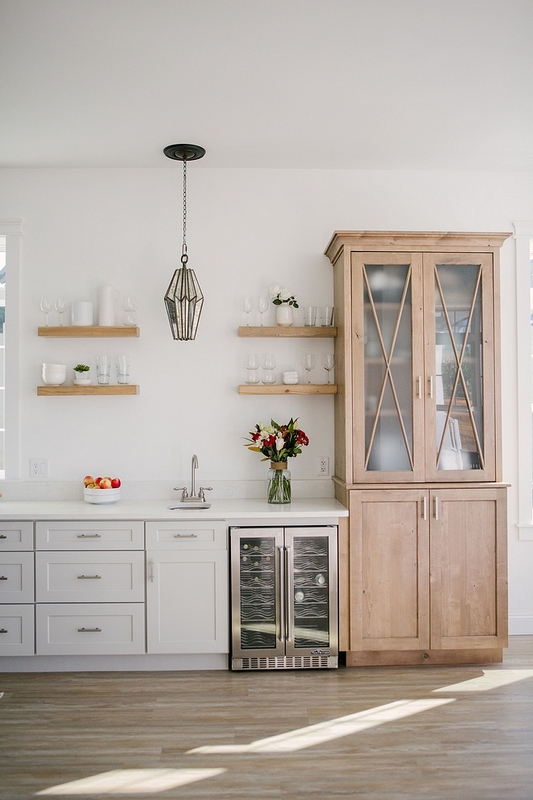 Cabinet Pulls: Lowes – similar here. 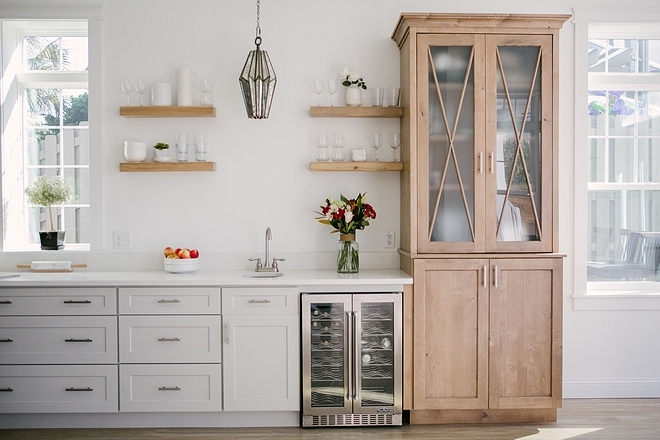 Cabinetry: Schuler Cabinetry, Knotty Alder wood in Cappuccino Burnt Sienna Glaze finish. 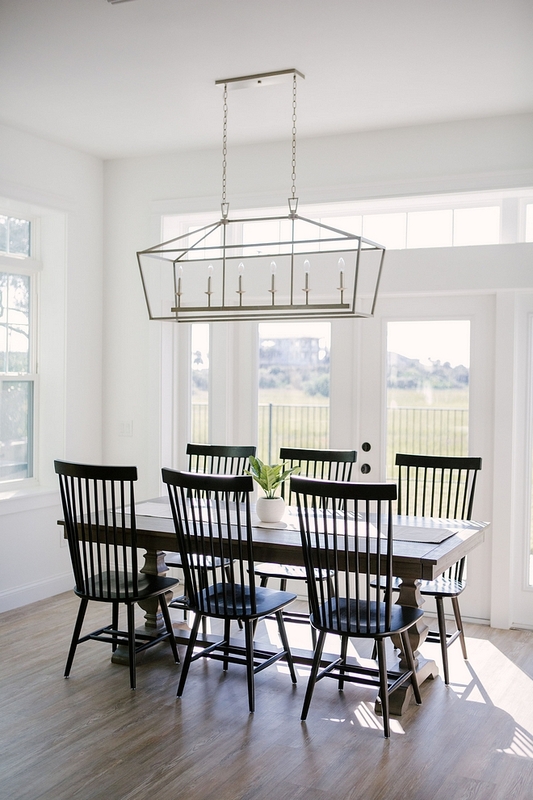 The dining area features a peaceful view and lots of natural light. 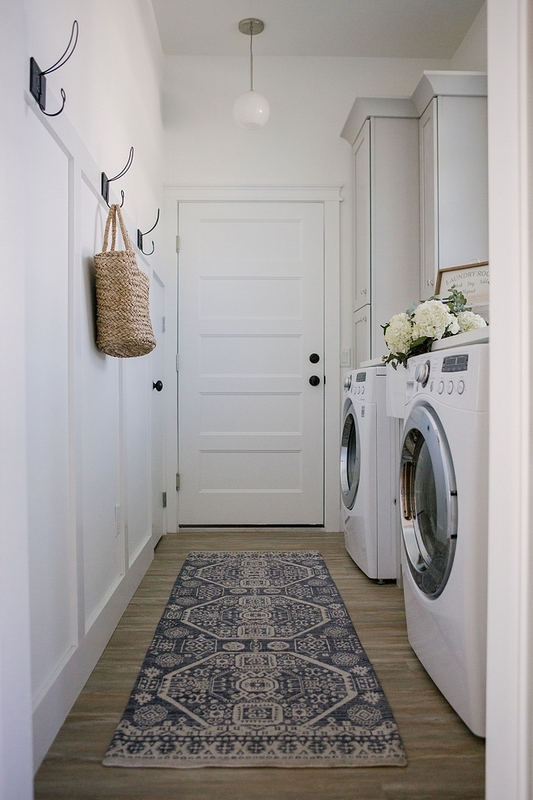 I love this simple and welcoming vibe. 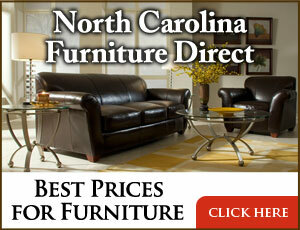 Dining Table: Pier 1 Imports. 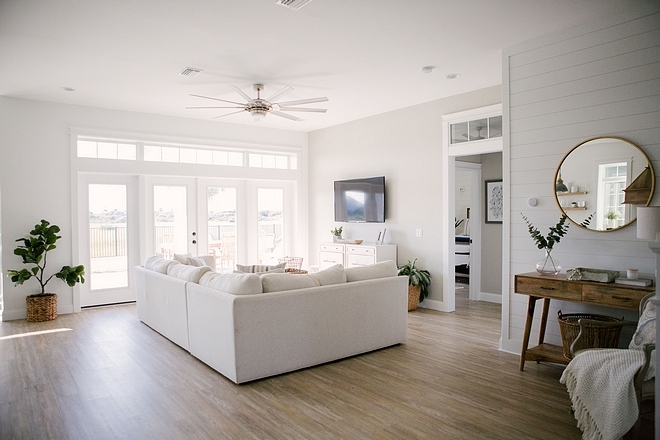 Flooring Throughout the house, including bathrooms: Stainmaster Luxury Vinyl, Washed Oak Dove – similar here & here. 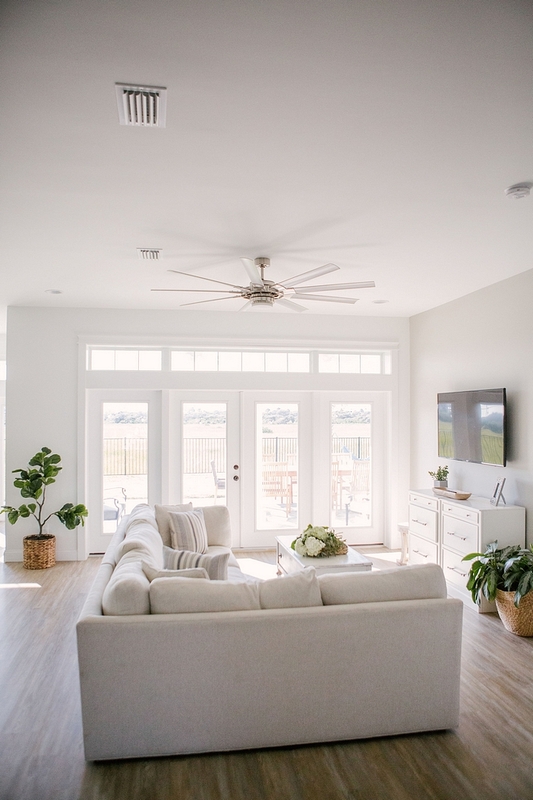 A fiddle leaf tree can make any space feel more inviting and beautiful. 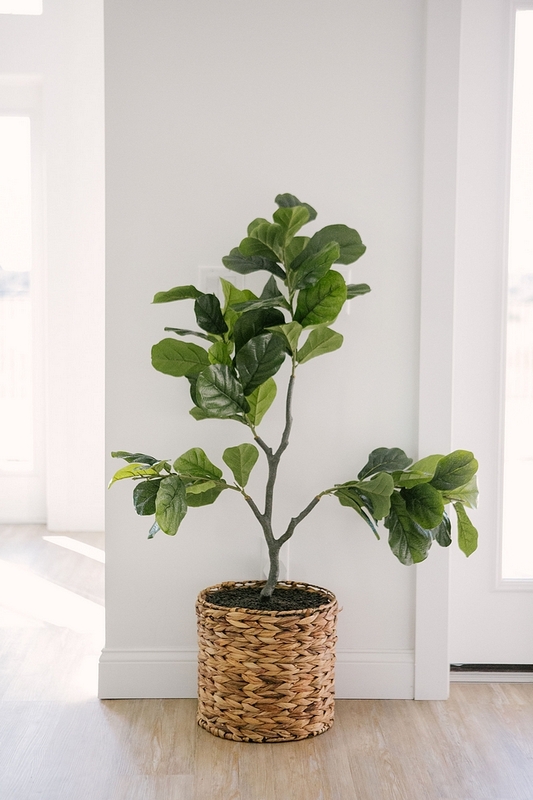 Fiddle Leaf Tree: here – similar. 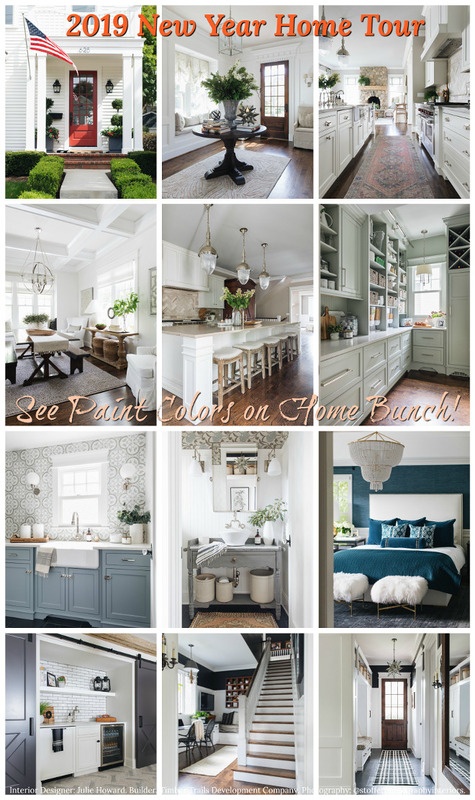 The interior paint color is Sherwin Williams Agreeable Gray – which is my go-to neutral color! 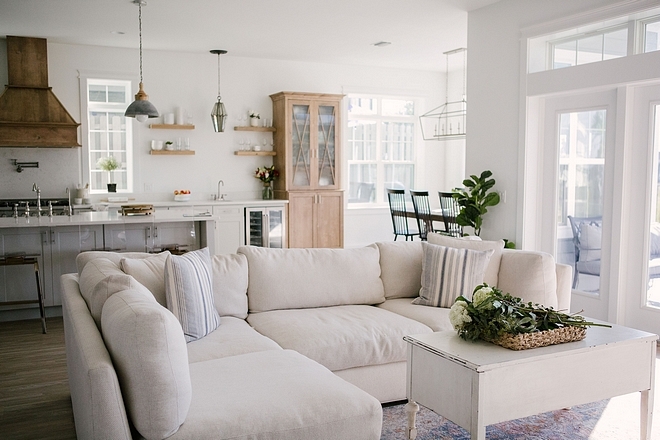 Sofa Sectional: Cindy Crawford Home Crosby Street White 4 Pc Sectional – Others: here, here, here, here & here. 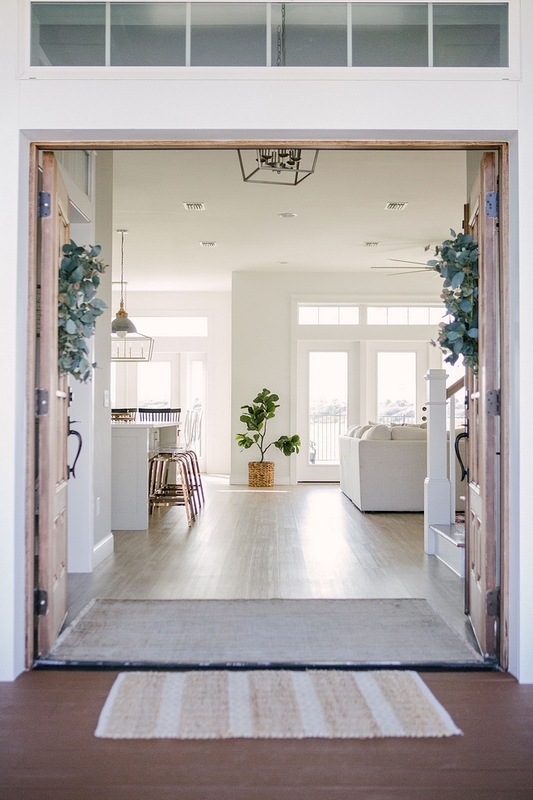 Rug: Joanna Gaines’ Magnolia Home. 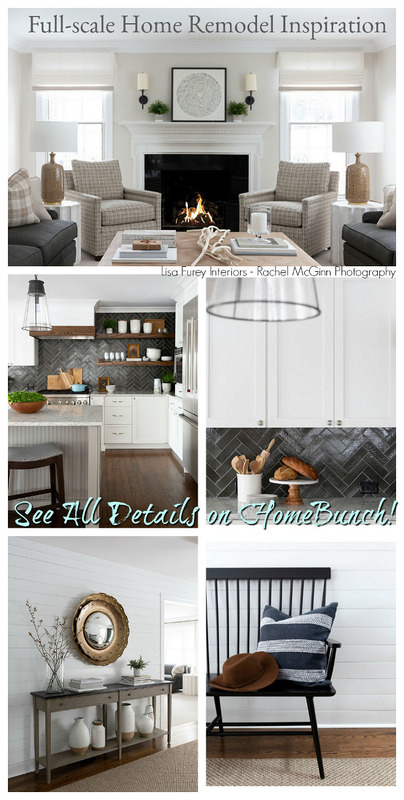 I love all styles of Home Decor but I especially love a modern rustic mix. 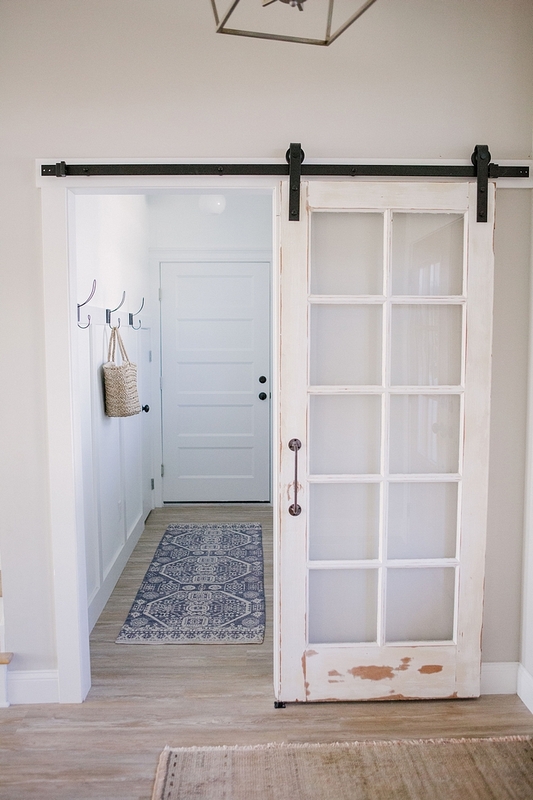 I made sure to incorporate some of my favorite antique and vintage finds into every space of our home, especially the addition of the barn doors. 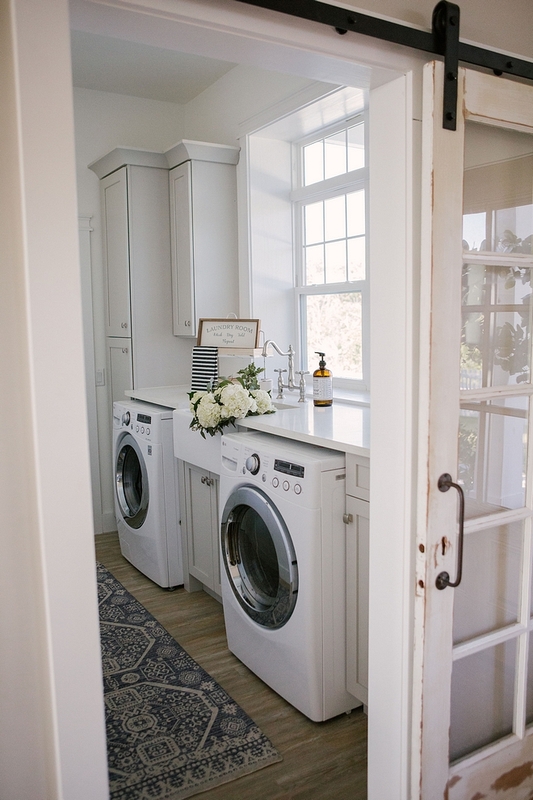 Jessica’s laundry room is very popular on Instagram and it’s easy to see why! 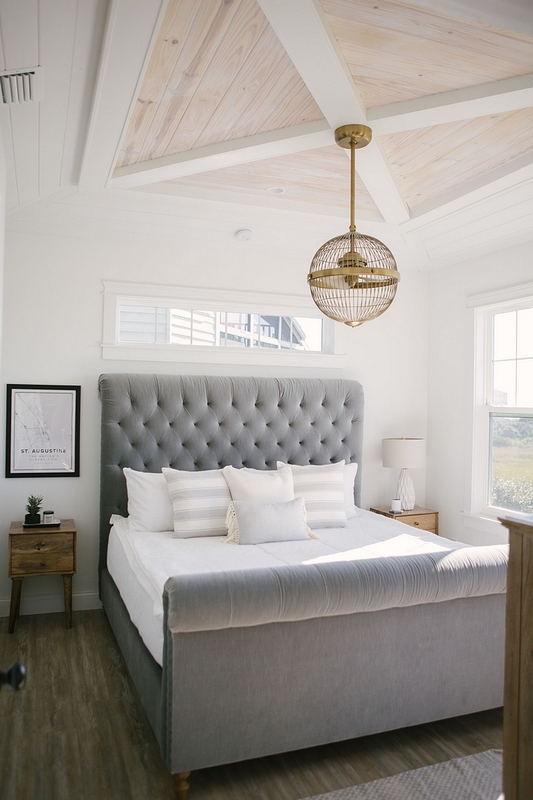 How dreamy is this space?! Runner is from Target – Others: here, here, here & here. These fun hooks are from Amazon. 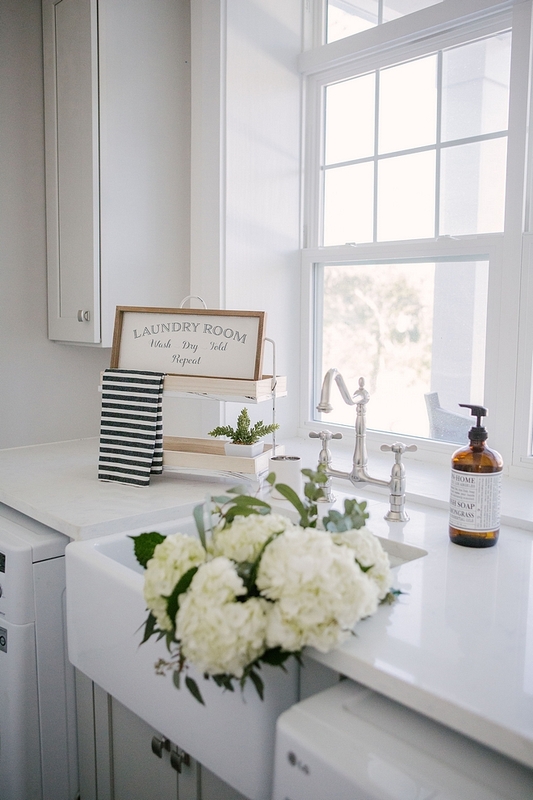 In my opinion, a sink is always a must in laundry rooms. They’re practical and you don’t have to end up cleaning muddy boots in the kitchen! 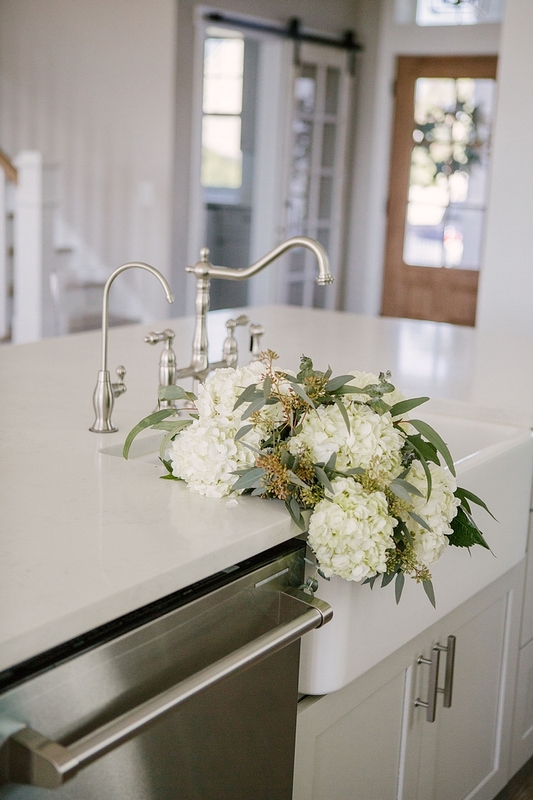 Countertop is Snow Point Quartz. 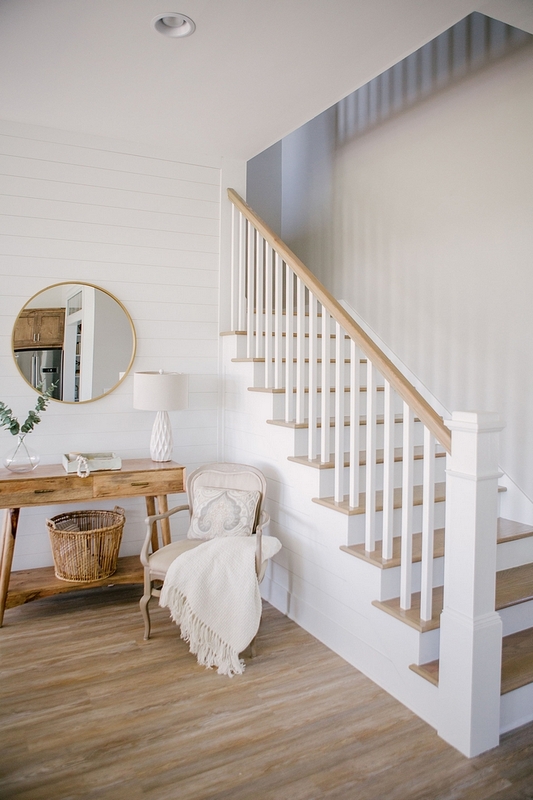 A beautiful staircase with shiplap, white spindles, white newel post and White Oak treads lead to the second level of this home. The kids are very involved in our projects we often take them to our job sites and it doesn’t end there. They witness first hand our commitment and hard work at home. Building our dream house as well as the rentals took great effort, time, investment and sacrifice for all of us as a family. Tracking the process and sharing it with others has become our passion and the kids are learning a lot along the way. 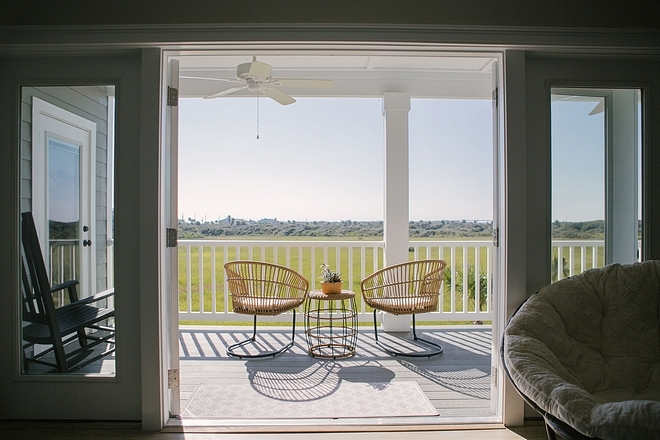 The upstairs family room features a stunning marsh and ocean view. 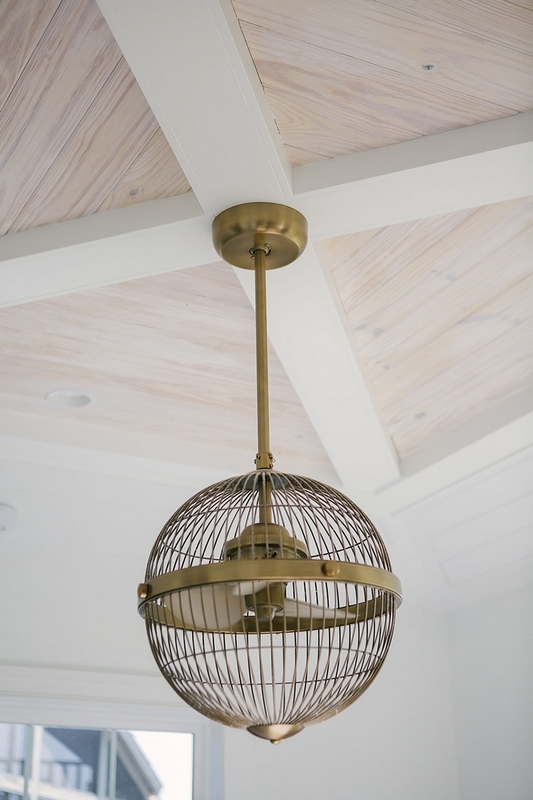 Ceiling Treatment: The 2nd floor features tongue and groove on ceilings. 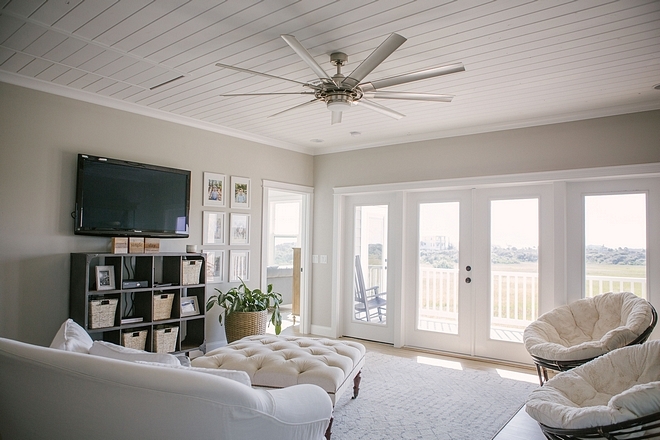 Ceiling Fan: Fanimation 72-inch ceiling fan. The paint color upstairs continues to be Agreeable Gray by Sherwin Williams. 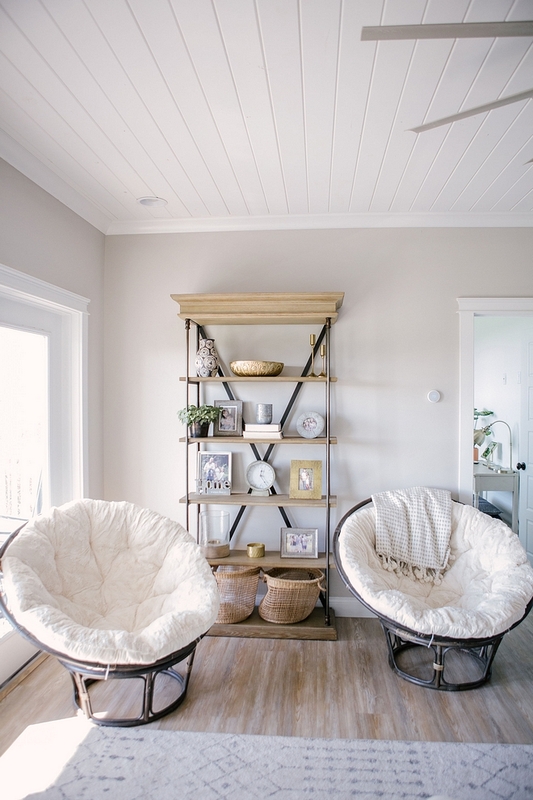 Chairs: World Market + cushion. 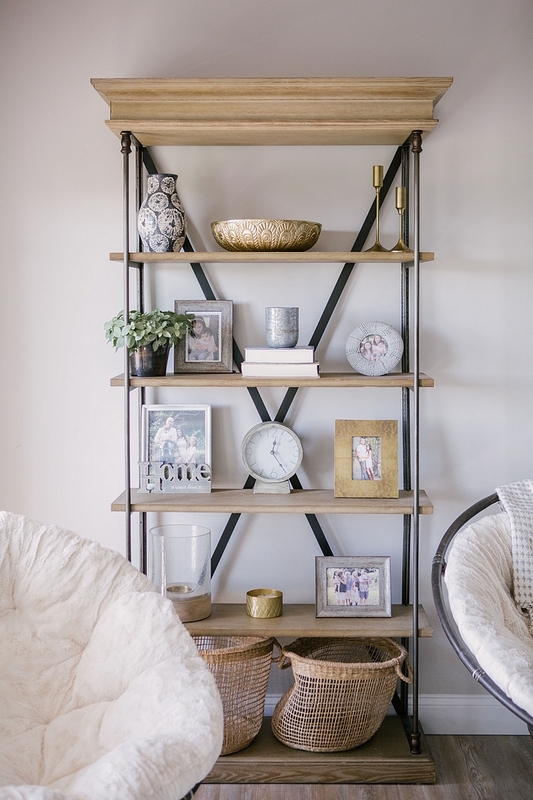 I love how Jessica decorated this wood and metal étagère bookcase. Étagère Bookcase: Wayfair – Wider: here. 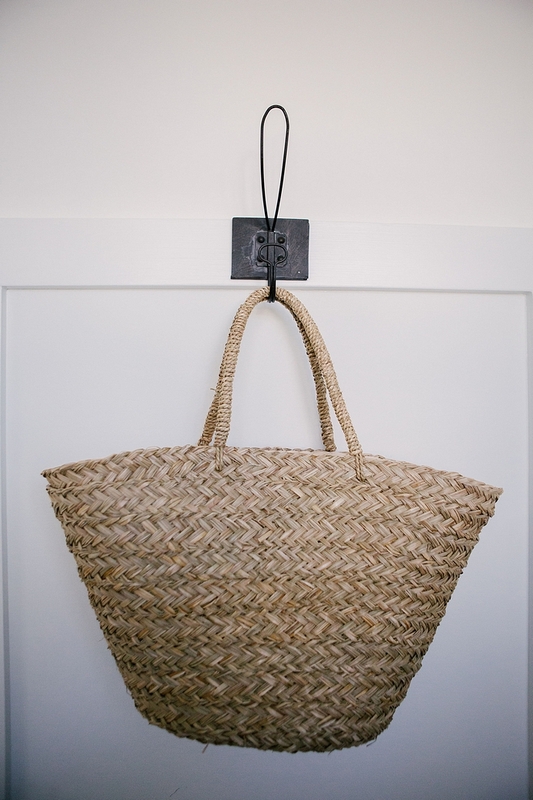 Baskets: Woven Natural Seagrass Basket Set Beige – Others: here & here. 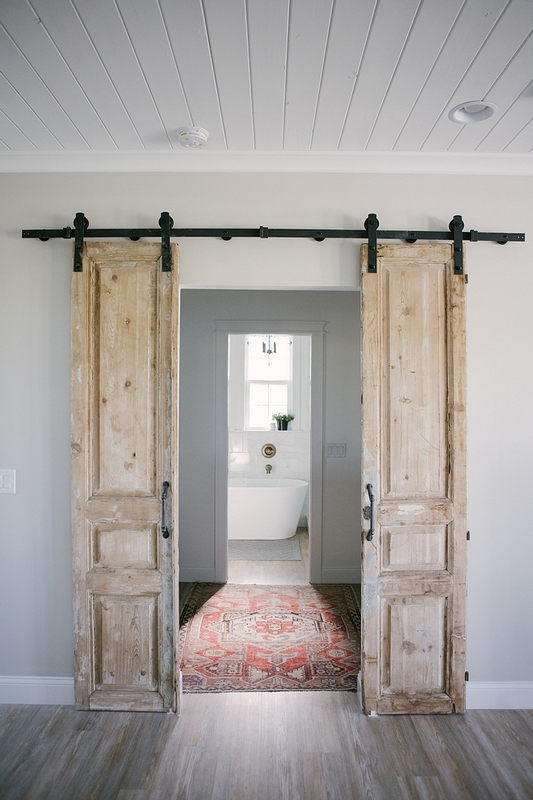 Hung on barn door hardware, these antique doors add personality and architectural interest to the kids bathroom. 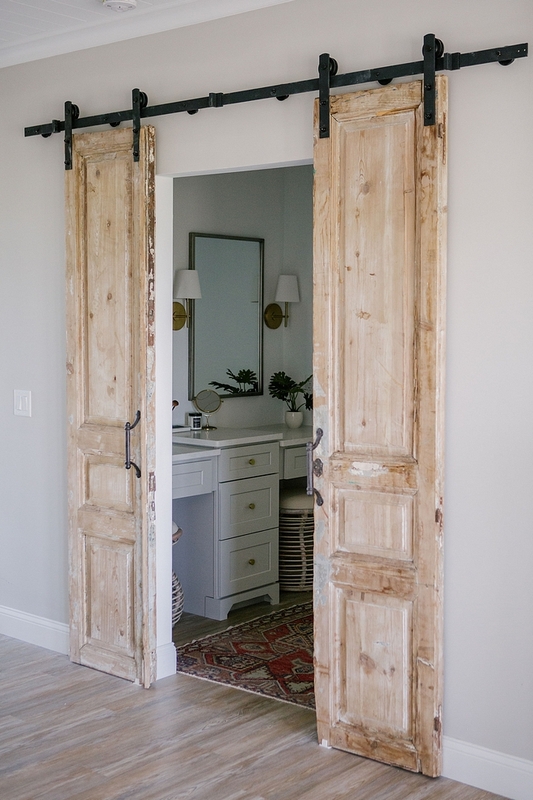 A pocket door separates the shower area from the vanity area. This is a great layout if the bathroom must be shared, which it is in this case. 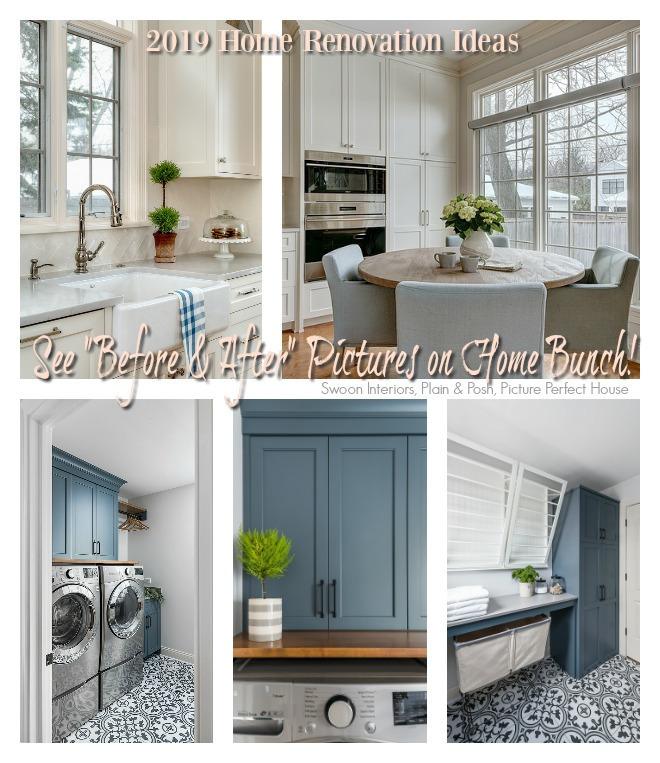 Cabinetry: US Cabinet Depot – Color is Dove Shaker. 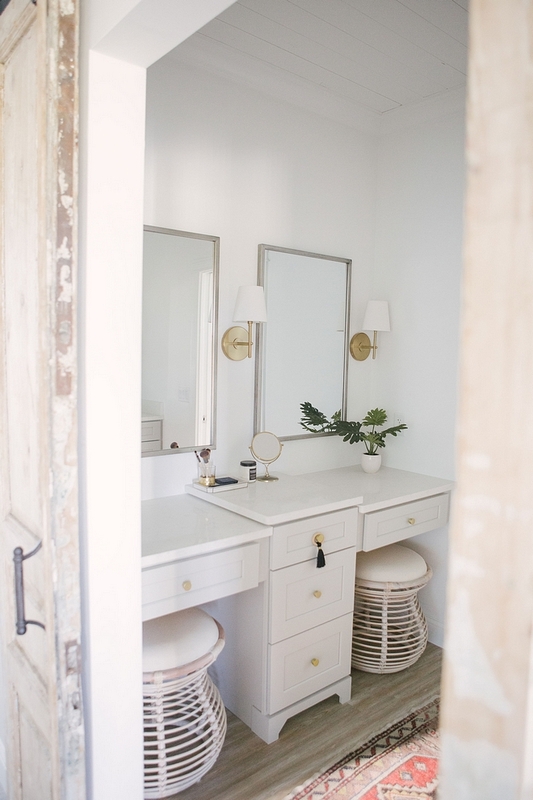 Vanity Stools: Joss & Main. 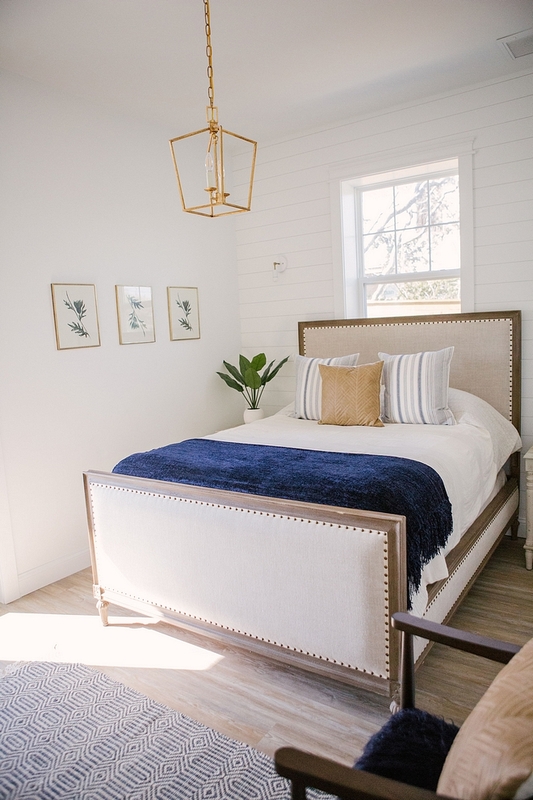 Sconces are from West Elm. Mirrors: here – Others: here, here, here & here. 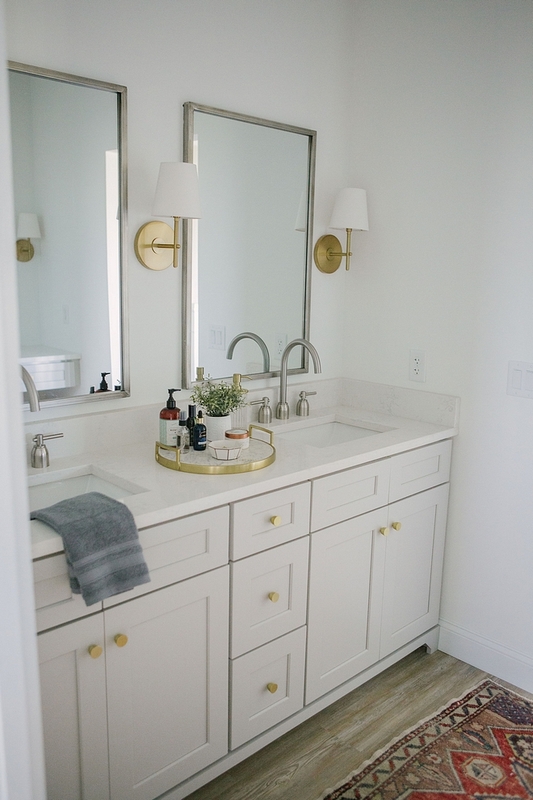 The brushed brass knobs are from Target’s Gathered Knob – similar here & here. 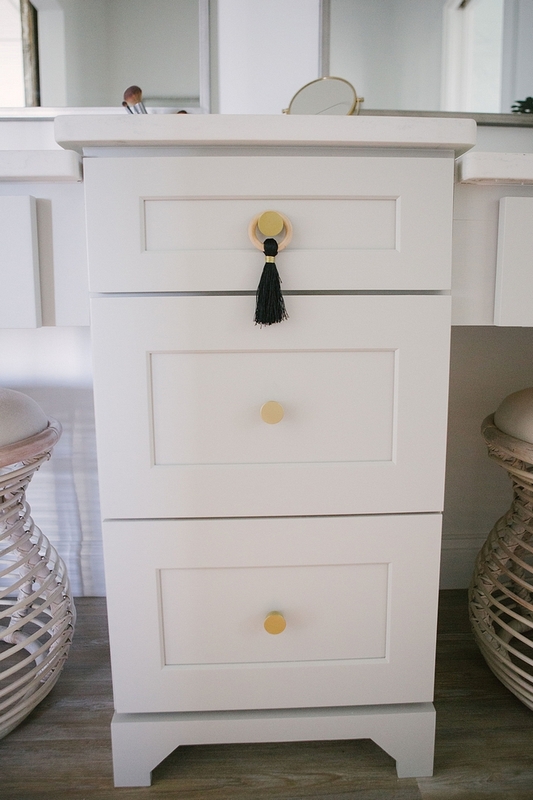 Freestanding Tub: Mirabelle – Others: here, here, here & here. Lighting: Allen + Roth – Other Geometric Lighting: here, here, here, here, here, here, here, here & here. 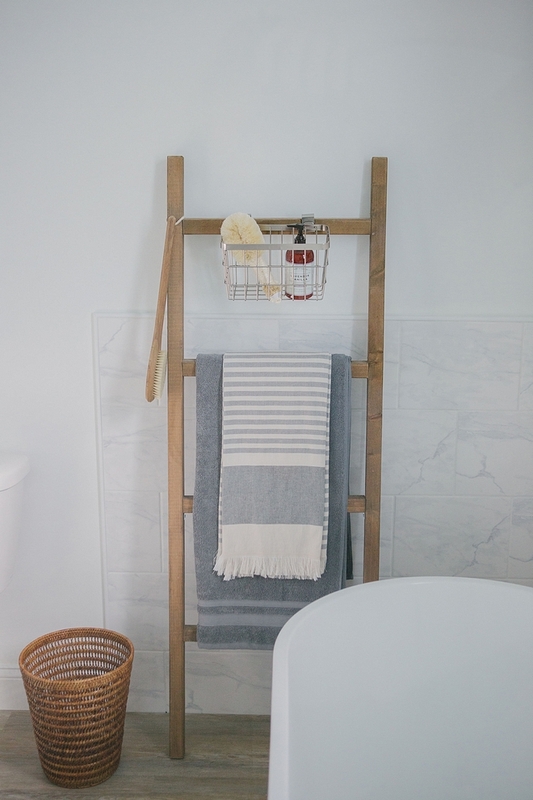 Blanket/towel ladders are a great way to add height and texture to a blank space and they add so much charm to a bathroom! Beautiful Ladders: here & here. 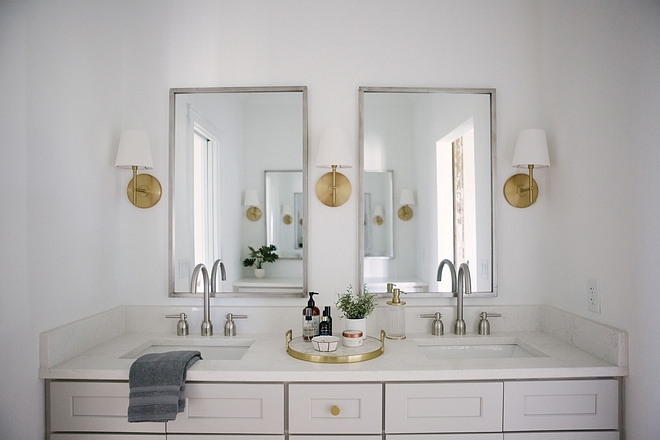 Wall Hooks: Target Marble and Brass Hooks – Others: here & here. 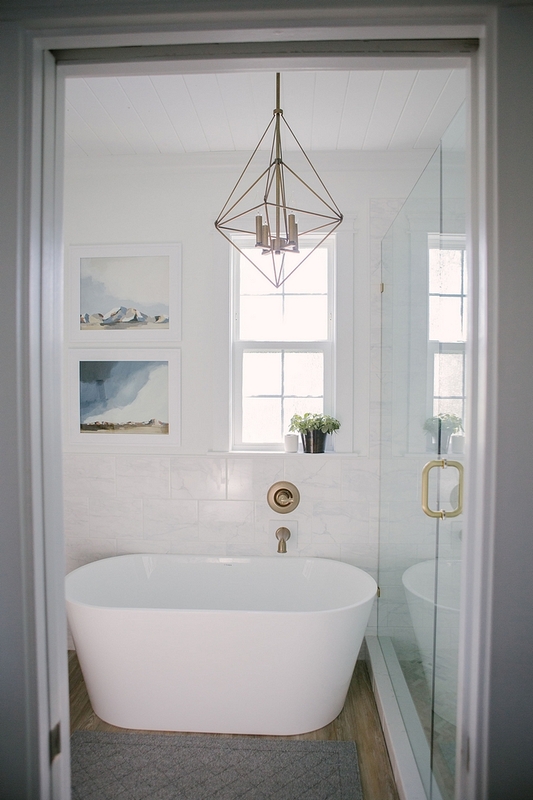 I love using large tiles on bathroom walls – they tend to be more economical and easier to clean! Shower Tile: Chevron Marble Tile. Shower Fixtures: Delta shower fixtures Linden Series Champagne Bronze. 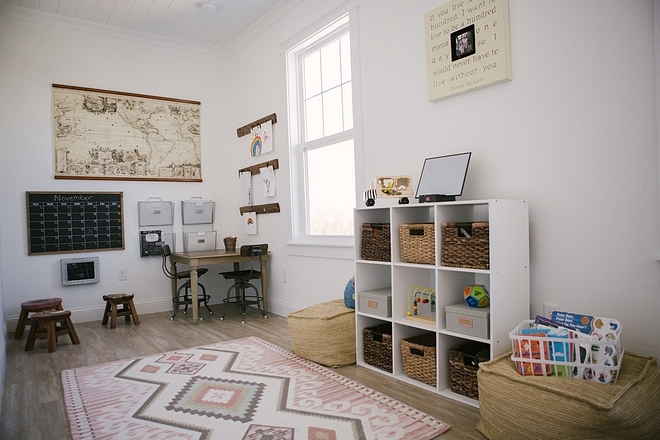 Jessica’s kids have a great space to play and be creative! Cube Organizer: here & here – similar. Baskets: here & here – similar. 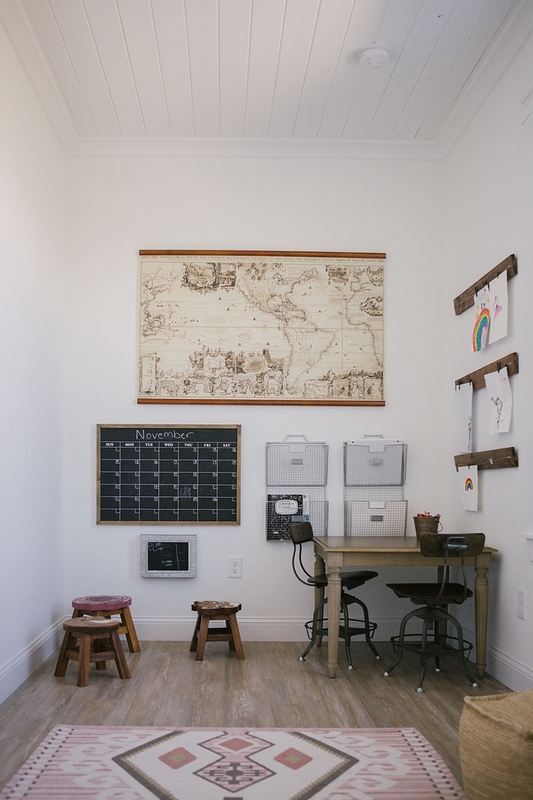 Chalkboard Calendar: here – similar. 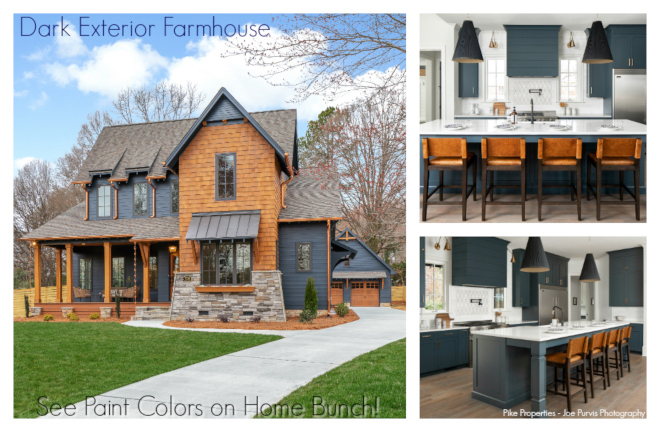 What a great color scheme! The grey bunk bed is Amani Full Over Full Bunk Bed. Rug: here, here & here – similar. 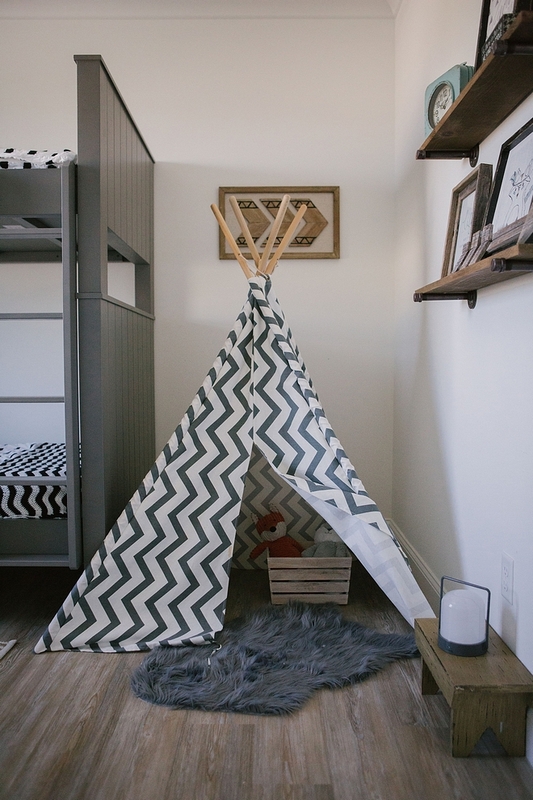 Adorable Teepees: here, here & here. 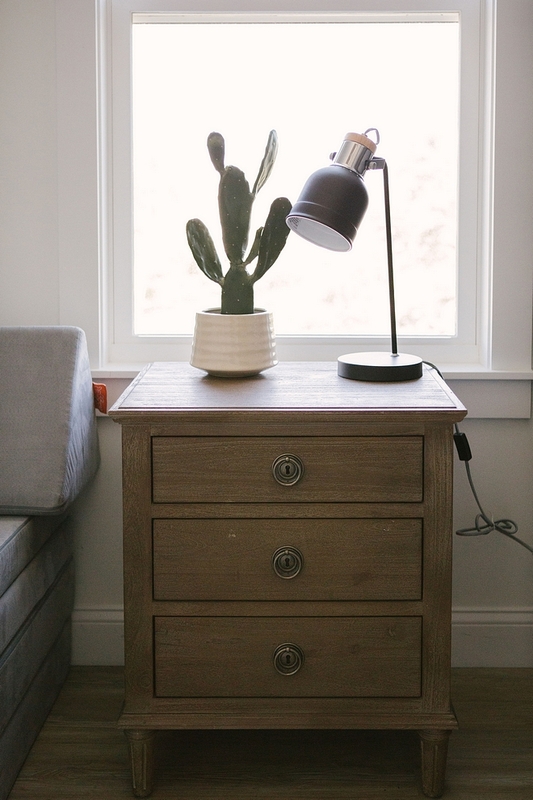 Nightstand: Joss & Main – Others: here, here, here, here & here. 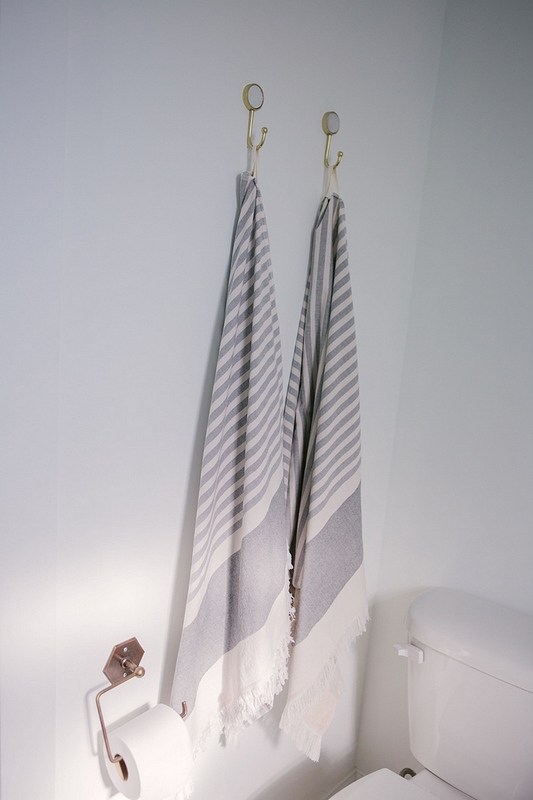 Navy Throw: here – similar. Beautiful Bedding: here, here, here, here, here & here. 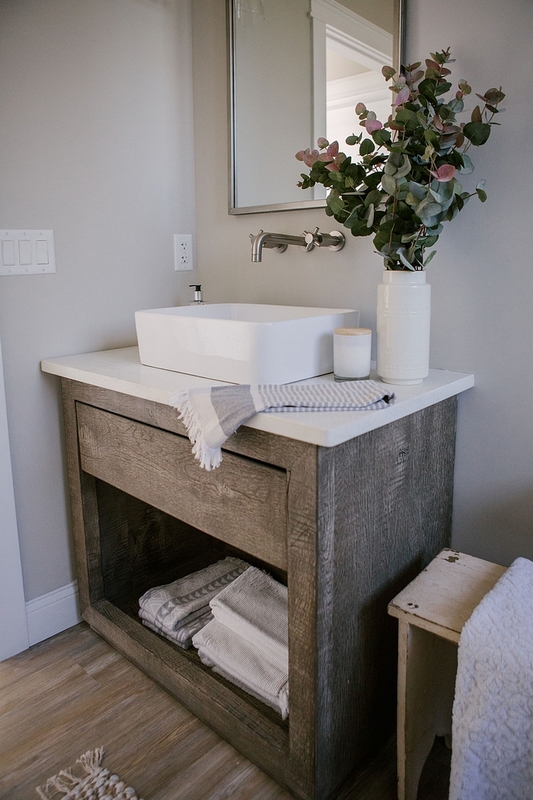 The guest bathroom features a gorgeous vanity made out of reclaimed wood. Vanity: RH Reclaimed Russian Oak Single Washstand – Others: here, here, here, here, here, here, here, here, here, here, here, here & here. 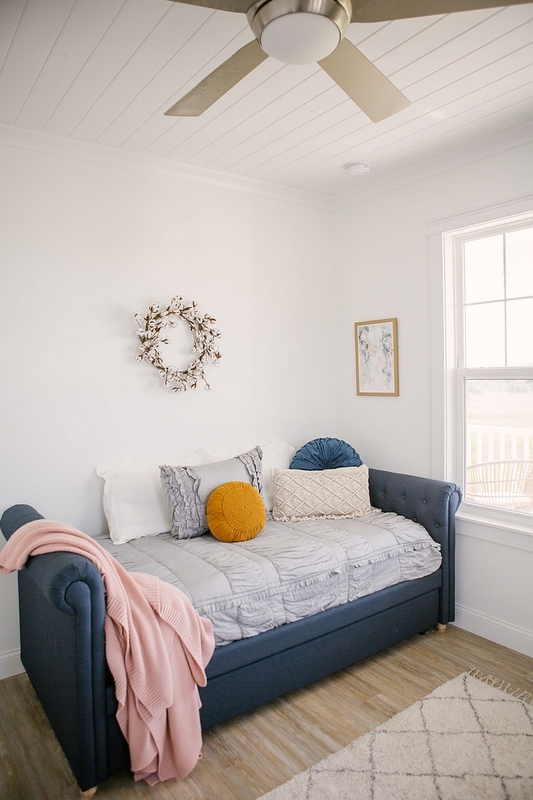 Trundle Bed: here – similar here. 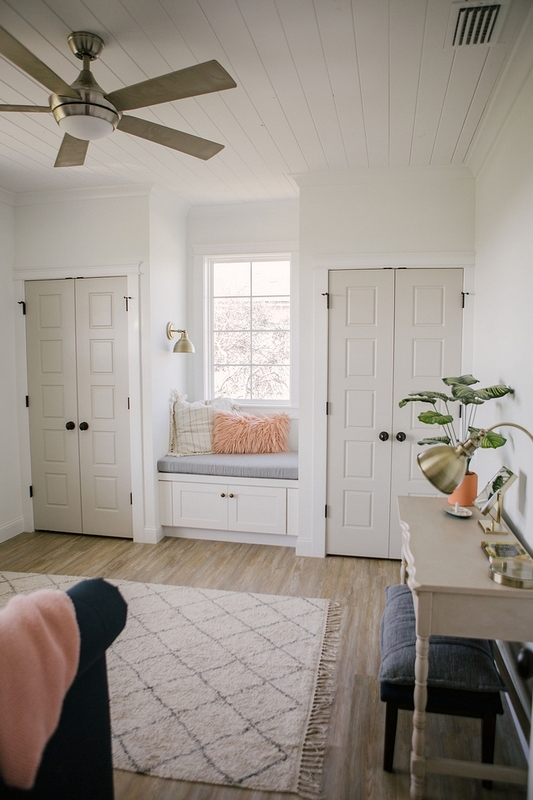 Closets, with greige doors, flank a window-seat. Rug: similar here, here & here. 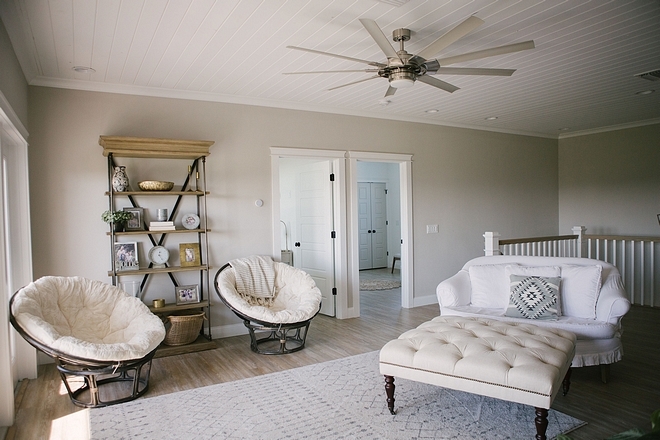 The master bedroom features whitewashed tongue and groove with crossed beams on ceiling. 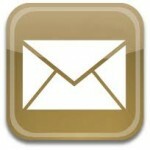 Bed: RH – similar here, here, here & here. 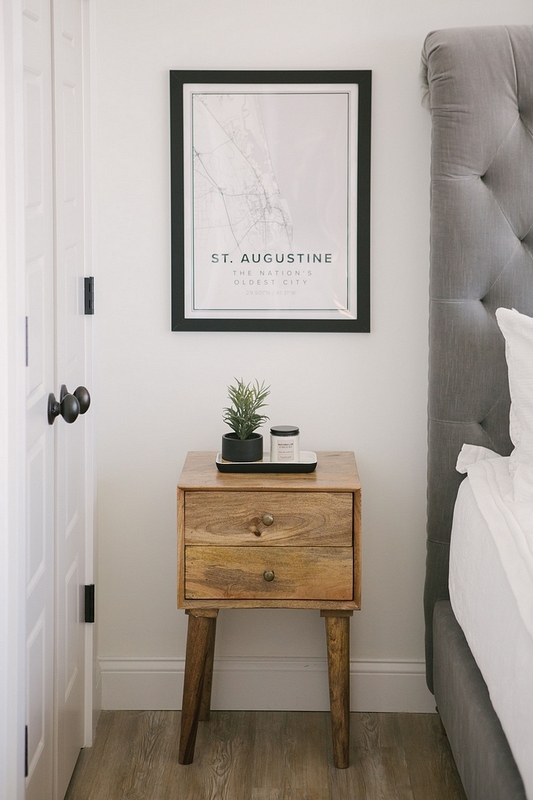 Mid-century Nightstands: here, here & here. Pendant Fan: Joss & Main. 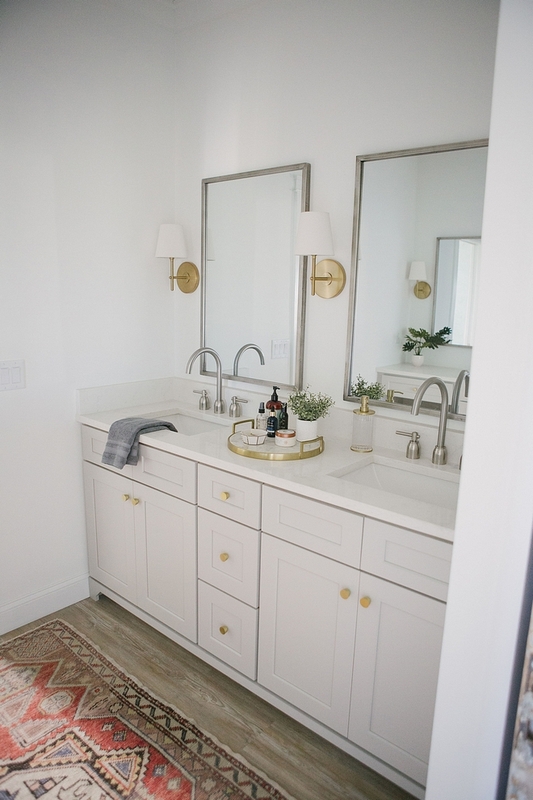 Cabinetry is White Shaker vanity, custom built. 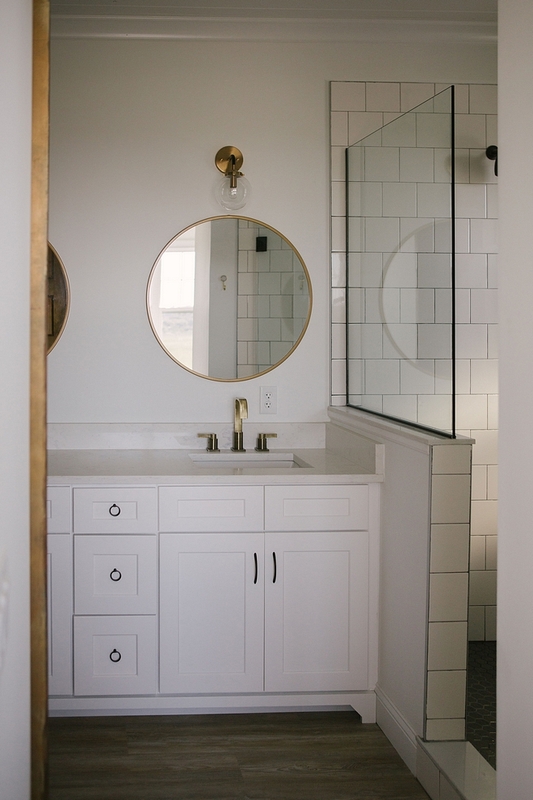 Similar Vanities: here & here. Our home is 2900 spft heated and cooled. It is 5 bedroom 3 full baths 2 bonus/office rooms and second living. 1 car garage Our goal was to stay under 3000sqft. We believe “to be happy at home is the ultimate result of all ambition”. Our homes are our platforms for being and doing our best in the world, and the places where we live out our most precious, private moments. 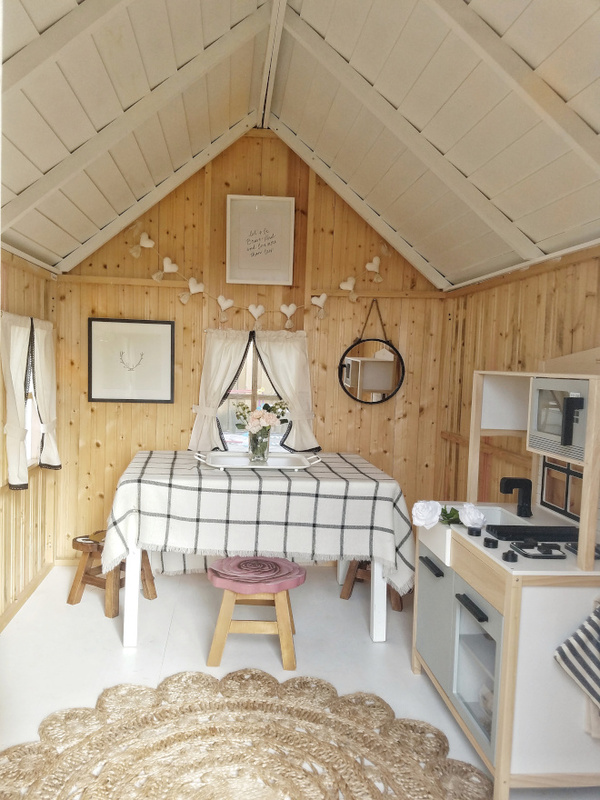 We hope to install that in our children and hope they follow their dreams to their logical conclusions where they almost all boil down to having a happy home, where we and our families can thrive and enjoy happy, secure and sometimes messy lives. 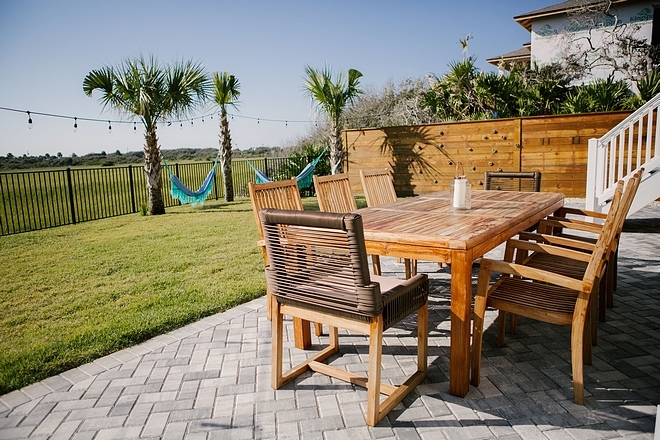 The backyard feels private and it’s perfect for entertaining. 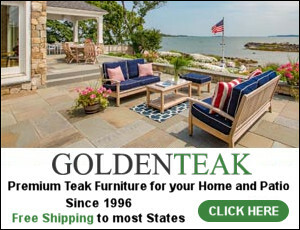 Patio wood Table from TH Gregory Imports – similar here & here. 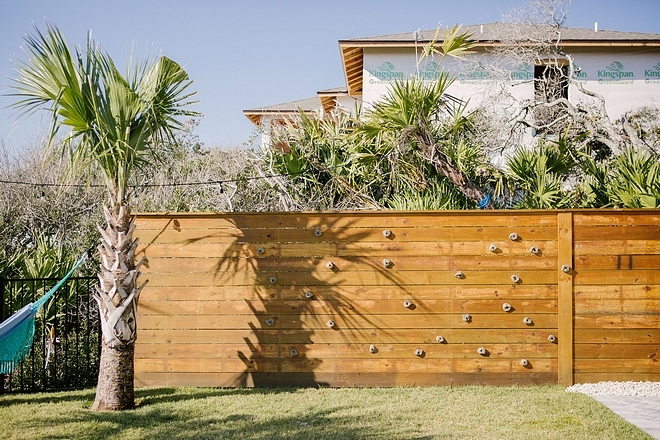 The fence features a DIY rock climbing wall. You really don’t need go on vacation if you live in Florida, right?! This is the dream!!! 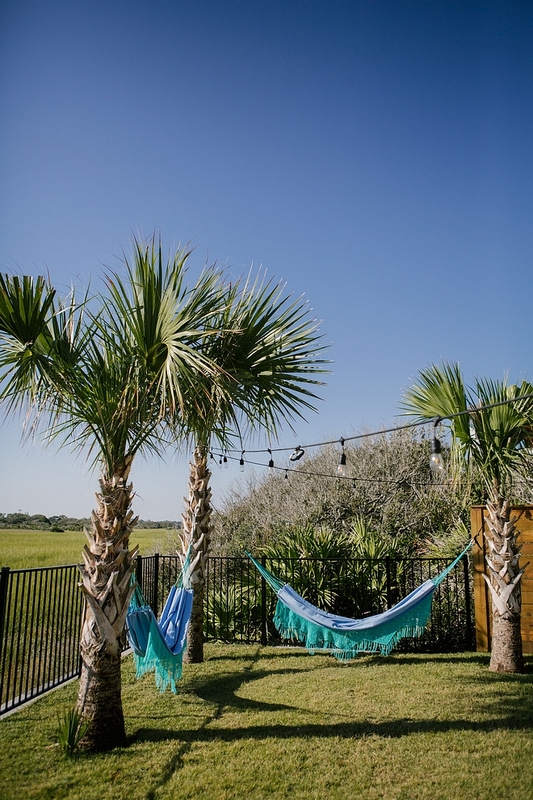 Beautiful Hammocks: here, here & here. 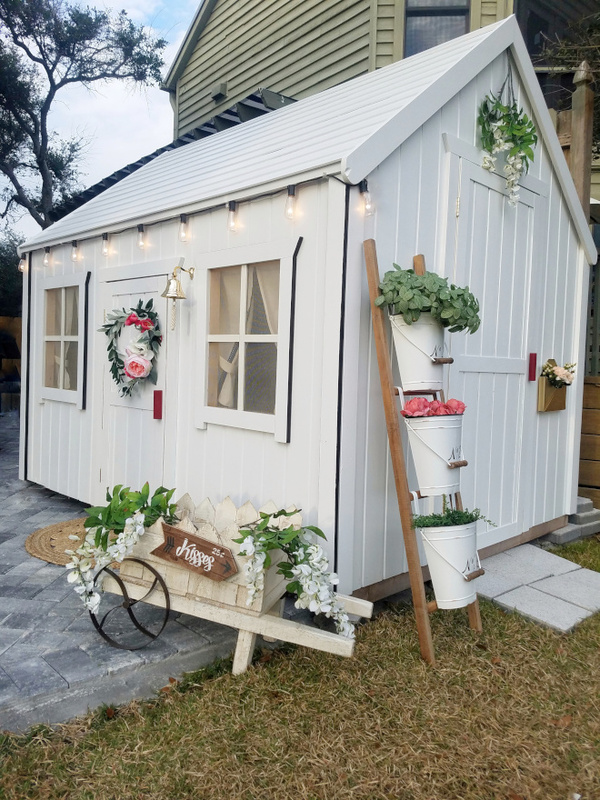 This is one of the most beautiful playhouses I have ever seen! Take a look at how Jessica decorated it. 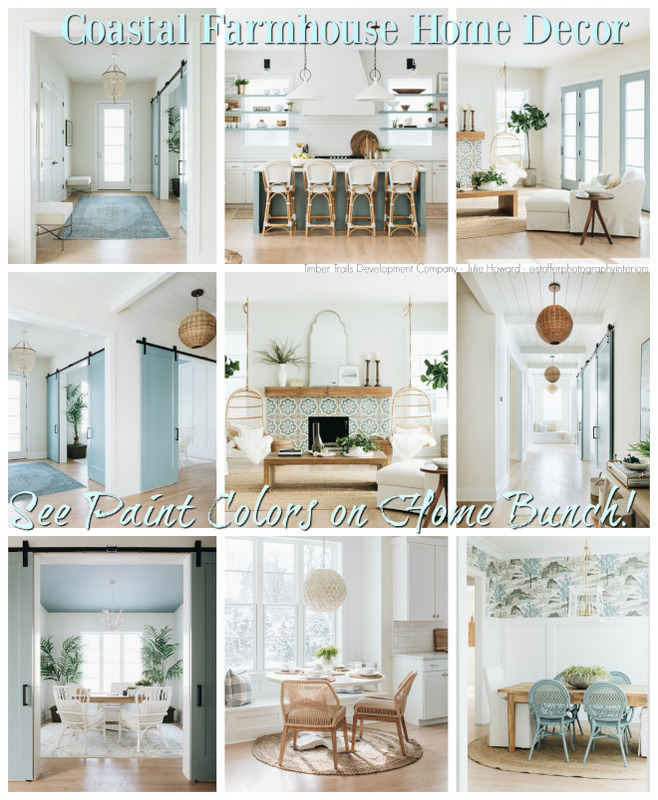 Jessica’s home is full of inspiration and I really hope you have enjoyed every picture! 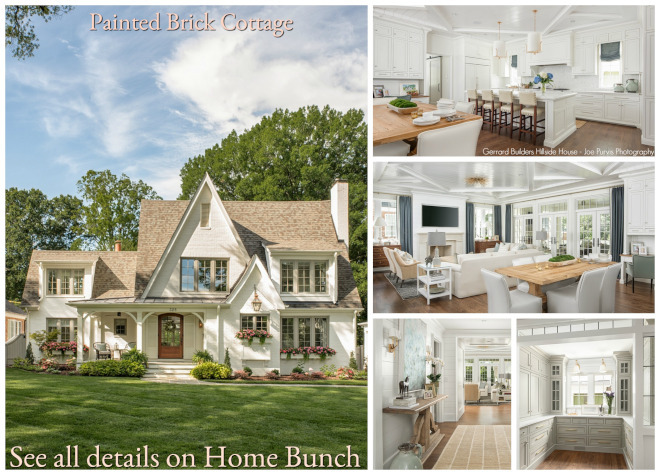 Many thanks to Jessica for sharing all of the details above. 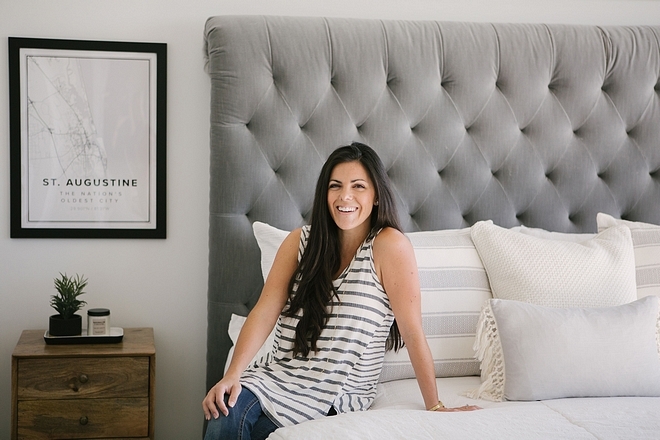 Make sure to follow her on Instagram to see more of her beautiful home!